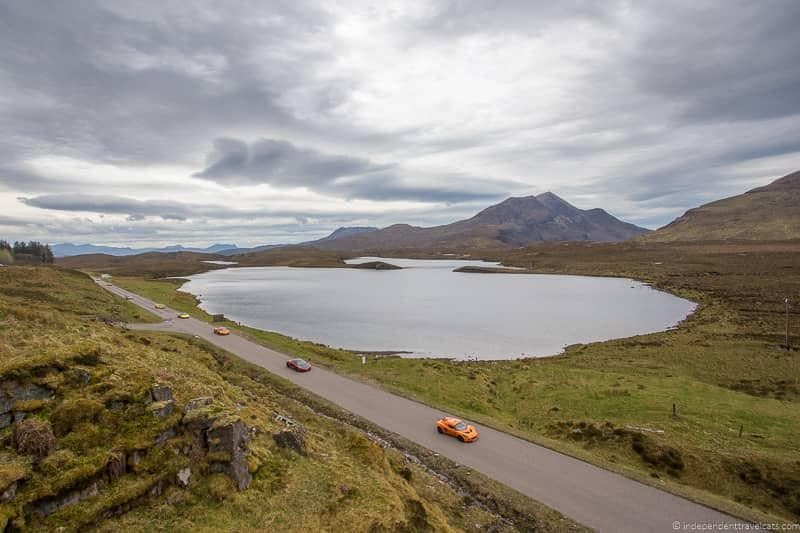 The North Coast 500 is a 516-mile scenic route along Scotland’s northern coast, offering drivers rugged landscapes, sandy beaches, wildlife, museums, castles, whisky distilleries, and so much more! 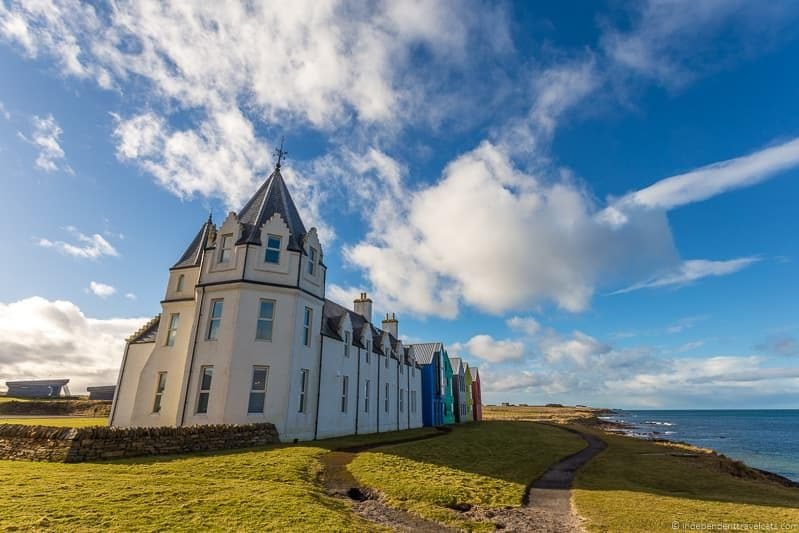 If you are planning to road trip around this scenic area of the Scottish Highlands, you may be wanting to spend the night at some special North Coast 500 hotels. Castle hotels. Historic Georgian and Victorian mansions. Luxury guest houses. Old crofts and farmhouses. Romantic B&B’s. Sea and lochside cottages. All of these and more are possible, but it can be time-consuming to search and choose from the hundreds of properties along the route. So we’ve done it for you, providing a list of over 25 personally recommended North Coast 500 hotels that are well-rated, well-located, and/or offer something unique or special. Our list includes everything from 5-star luxury castles to cozy family-run B&Bs, with information, a review, and tips provided for each of the properties. We also provide you with additional advice such as how far in advance to book hotels, what to expect from NC500 hotels, and how much to budget for North Coast 500 accommodation. So let’s get on with finding you the perfect North Coast 500 hotels for your ultimate Scottish road trip! What Amenities to expect at NC500 hotels? What NOT to expect from hotels along the North Coast 500? How far in advance should I book North Coast 500 hotels? Can I just Drive the NC500 and Book Accommodation as I go? How much should I expect to pay for North Coast 500 hotels? Where to find more information about the North Coast 500? 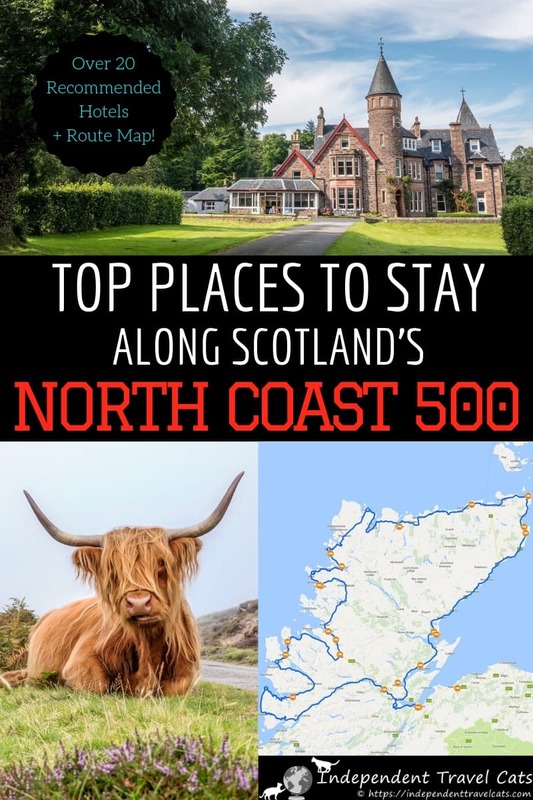 We’ll share a bit of what to expect of hotels along the North Coast 500, what not to expect, how far in advance to book, and other tips for choosing and booking hotels along the NC500. Like elsewhere in the UK, most hotels are going to include all the basic essentials like TVs, direct dial telephones, basic toiletries, and en-suite bathrooms. Most also include in-room kettles or coffee makers. Heated towel racks and even heated floors are pretty common and you can find rooms with working fireplaces at some properties. 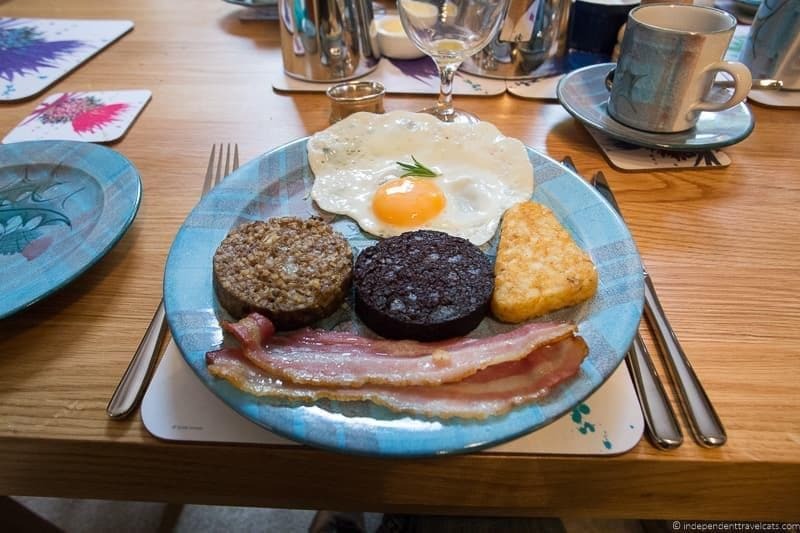 Most NC500 hotel rates include a breakfast, which is often a cooked Scottish breakfast (eggs, meats, tomato, toast) and often a more simple continental one is also offered. Many hotels and B&B’s offer a dinner option as well given the lack of nightime dining options in many of the small towns. Free on-site parking is almost always provided, although you may want to check in larger towns (e.g., Ullapool and Inverness). Free wireless internet is also available at most, but not all, North Coast 500 hotels; however, in many hotels the WiFi is only available in the public areas. We have almost always had good hospitality and friendly service in Scotland and this has been true whether staying at a luxury castle hotel or a small 2-room bed-and-breakfast. The friendliest service can often be found at the smaller family-run spots. If you are planning to stay in hostels or budget hotels, you may need to share bathroom facilities, bring your own linens and towels, bring your own food for meals, etc. Just be sure to check the website or with the property to know what to expect and be prepared. For those staying in self-catering properties, be sure to plan where you’ll pick up groceries and supplies as not all towns have grocery stores or shops. If you have traveled in rural Europe before, you’ll have a good idea of what to expect. There are exceptions of course, but here are some general things you should NOT expect along the North Coast 500. Chain hotels. If you are used to staying in big chain hotels (e.g., Hilton, Sheraton) or budget chain motels (e.g., Travelodge), you won’t find many along this route. The norm is 4 to 20 room bed-and-breakfasts, historical properties, boutique hotels, and each tends to have its own unique character and quirks. To us, this is refreshing and part of the travel experience, but may be a bit off-putting to those used to staying in one particular type of property. Strong Wifi connections. Connections are typically good in Inverness but after you leave this city, expect less consistent WiFi. This is for a couple of reasons. First, many of the North Coast 500 hotels are historical properties and many have very thick walls, making good and steady WiFi connections difficult. In these cases, WiFi is often only usable in the public areas. Second, most of the lodging options are in rural and remote spots where the quality of available Internet options is limited. We had good WiFi connections at some places, but not others. We never went more than 24 hours without finding a WiFi connection at a hotel, cafe, or museum so we were always able to at least check our emails. If WiFi is important to you, I’d read hotel reviews about it before booking, but I would just not count on super fast WiFi anywhere to avoid disappointment. If you really need to get online for something important and can’t get online, hotel staff at most places should be able to get you online from a wired connection at the front desk. Some areas along the NC500 are expected to gain access to high-speed WIFI connections in the near future, so coverage will likely improve in many spots over the next few years. Consistent cell coverage. Like the WiFi connection, expect your cell phone coverage to be spotty in the more remote areas. Your coverage and signal strengths will vary and will depend on your provider, but expect to lose service in some areas. If you have no signal at your hotel, most hotels provide in-room phones with reasonable rates. Enormous rooms. If you are used to traveling in the U.S., hotel rooms on average are smaller in Europe compared to the United States, and many of the hotels along the NC500 are historical properties built before the time of indoor plumbing and electricity. Although we did have spacious rooms on our trip, do expect smaller rooms and especially smaller bathrooms than you might be used to in the U.S. If you want a larger room, book a premium room or suite. Elevators. Elevators in Scottish hotels are rare, especially along the North Coast 500. So this means that if you choose to stay in a fourth floor tower room, you’ll likely be lugging your luggage up windy narrow staircases. In nicer hotels staff should be available to assist you with your luggage you but you’ll still need to walk up and down the stairs. Accessibility. Those in wheelchairs and those with mobility difficulties are wise to check ahead to make sure the lodging can accommodate their needs and to book rooms that are have good access. Many of the larger hotels (especially more newly built ones) offer at least one or two accessible rooms, but a lot of small bed-and-breakfasts and historical hotels are not able to offer fully accessible rooms. I would recommend that you start researching lodging options as soon as you know your dates. I would book at least 3 months in advance if possible. Staff at several of the busiest properties recommended to us that travelers should try to book 6 months in advance to guarantee a room as they had some dates fully booked 6 to 9 months in advance. Now, six months is a pretty long time in advance so don’t worry if you just decided to drive the NC500 and it is 2 months away, you’ll still find plenty of places with availability, but start booking now. Just note that the most in-demand properties and the best value ones often get booked up well in advance. The busiest time along the North Coast 500 is May to October with weekends being the most busy. Also be aware of festivals, Highlands gatherings, holidays (Christmas and Hogmanay), and other special events as these can cause entire areas to be booked out well in advance given the relatively limited amount of lodging in many of the towns. For example, we were not able to stay within an hour’s drive of Durness as we wanted even though our accommodation was booked months in advance because there was a marathon taking place. Although summer is the busiest time, given that many North Coast 500 hotels are seasonal, it can still be difficult to find last-minute accommodation any time of the year as over the winter you have fewer options. When we traveled this past winter, we were booking about 3 days to 1 week in advance without an issue. Can you get away with not booking in advance? Yes, but it may make for a more stressful trip if you are having to hunt for a place to stay each night. During our trip, we heard lots of stories of people having to significantly overpay, drive an hour out of their way, or even sleep in their car due to not having pre-booked accommodation. Although a few of the larger properties often have rooms available for more last-minute bookings, you’ll often pay higher rates for these if you wait until the last minute and will have little to no choice in room category. If you are the kind of person who doesn’t want to commit to being in a certain place at a certain time, consider camping or at least bringing camping gear as a backup plan. If the flexibility of a campervan appeals, there are also a number of places to rent campervans or RVs in Inverness. If you do rent a campervan, I would recommend getting the smallest size you need as some sideroads are not accessible to larger vehicles. This really depends on what type of hotel you want to stay in and your budget as you’ll find a large range of accommodation along the route from hostels to simple inns to boutique B&Bs to luxury castle hotels. So budget backpackers should be able to find a place to sleep for £20 to £30 per night and luxury seekers may pay up to £300 or more per night. But you’ll find lots of accommodation in the £70 to £180 range for a double room. Some of the NC500 hotels offer discounts for those booking multiple nights, and off-season rates can be 20% to 50% off high season rates. Book well in advance (worth repeating! ), especially if there are certain hotels you really want to stay at or you have a strict budget. Note that most North Coast 500 hotels (and many places in the Scottish Highlands) don’t have exact addresses which can confuse some GPS systems. Most don’t have street numbers and sometimes they don’t even have a street. But don’t worry, it just means that they are located in a rural spot or small town and are generally easy to find once you get there. 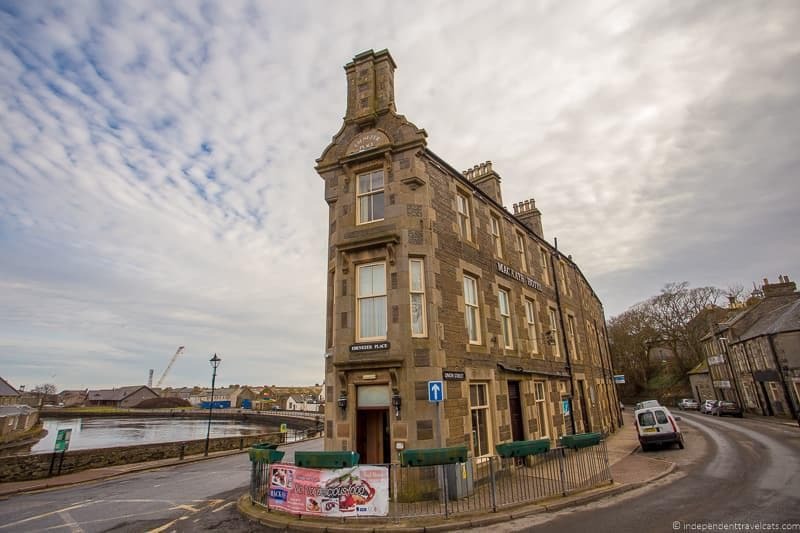 There are a lot of properties in Scotland with the same or similar names, and there are even a few properties along the NC500 with very similar names (e.g., Mackays Hotel in Wick and Mackay’s in Durness). Be very sure that the area your GPS is taking you matches with where the hotel you reserved should be located! A note on official hotel ratings. In Scotland, the two main rating systems for hotels are the Automobile Association (the AA does UK wide ratings) and the those from VisitScotland, the Scottish Tourism Board. Both parties rate some of the hotels, restaurants, and attractions in Scotland from one to five stars (five stars being the highest) so you may see two different ratings for the same property. However, we have not always found these ratings to be entirely useful. So I would use them as a guide (as you would for any rating system from AAA to Tripadvisor) but don’t be surprised if you find quite a bit of variation across NC500 hotels with the same star rating. We find it best to focus on recent customer reviews. Don’t sweat the small things. Remember that some of the NC500 properties are operating in pretty isolated areas. Know that bad weather, a blocked road, or staff illness can really affect hotels along this route. If the promised WiFi isn’t working or there is no fresh melon for breakfast, these things may not be in control of the hotel staff. Don’t let the small things ruin a wonderful North Coast 500 road trip! Take the time to talk to the staff and owners. Most staff will be happy to chat with you, so take advantage of it to learn more about the property, the area, and their recommendations for what to do in the area. You’ll likely discover some new spots to add to your itinerary. First, I’d recommend reading our North Coast 500 road trip guide, which has all the information you need about the route, how to drive it, when to drive it, where to rent a car, what to pack, etc. You can also find loads of information from the official North Coast 500 official visitor website, which has advice and route information. 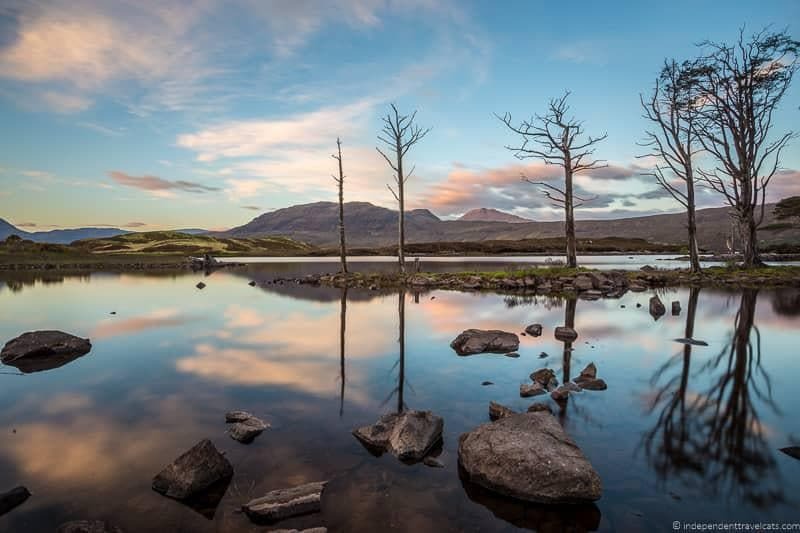 Laurence has also put together a recommended 7 day camping itinerary, a list of our favorite NC500 B&B’s, a list of North Coast 500 highlights that you’ll want to consider adding to your own itinerary, and this guide to best North Coast 500 photography spots. You may also want to pick up a copy of the latest edition of the Rough Guide guidebook to the North Coast 500, and a good Scotland touring map for your trip. If you start in Inverness, you can also stop by the Inverness Visitor Center where you can find printed maps and ask staff for information on planning your trip. Now let’s move onto a list of actual lodging options along the NC500 shall we? These hotels were chosen for inclusion on our list for one or more of the following 3 reasons: 1) they offer a unique experience (e.g., castle, historical building), 2) they are exceptionally well-rated, and/or 3) they are well-located along the route. Most on the list meet all 3 criteria! We are not recommending any place we would not spend the night, and we have stayed the night in a large number of the hotels on this list and have visited almost all of them to either check out the rooms, have a drink at their bars, or a meal in their restaurant. In terms of budget most fall in the mid-range to luxury category with most rooms ranging from about £80 to £270. If you are looking for budget stays, only a couple of places in this list are likely be a good fit; however, if you a budget traveler looking for one special splurge stay along your trip, this list should help you find it! If you are looking for B&B’s, check out this list of B&B’s along the NC500 route which range from budget to mid-range. So let’s move onto the North Coast 500 hotels which are arranged in order as you go along the route. 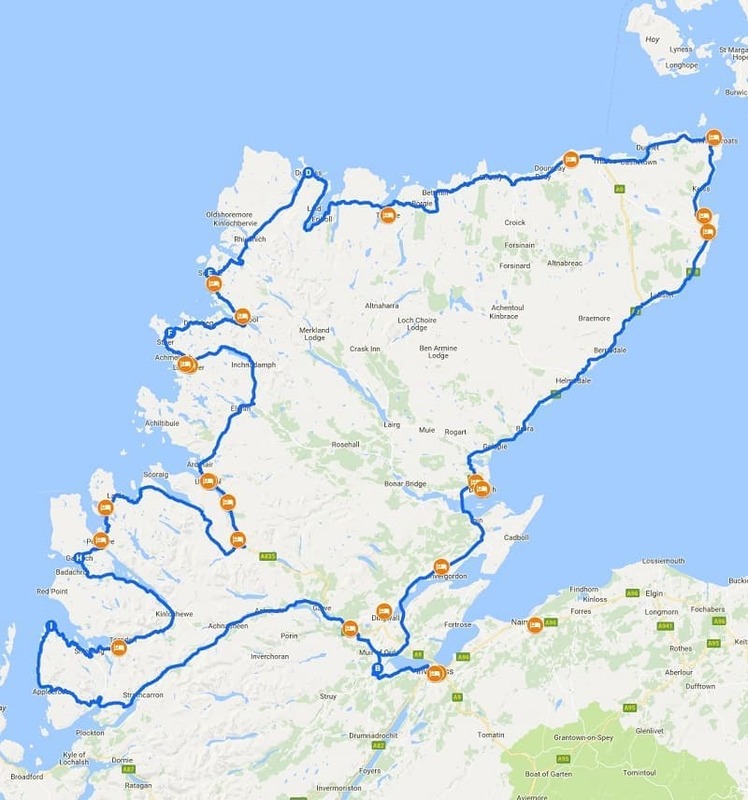 We put the hotels in the order in which we drove the NC500 so starting and ending in Inverness and following the route counterclockwise (east to west) although you can of course start the route in any place and go in either direction. Just reverse the list as needed. Hopefully this guide will help you choose hotels for your special NC500 road trip! Inverness is known as the Capital of the Highlands and as the largest city in the Highlands, you’ll find the largest number and range of accommodation here. This is a common starting and ending point for North Coast 500 travelers, and a good place to pick up a rental car if you need one. This is also the best place along the route to stock up on any needed supplies for your trip. Note that since this is a city (although a small one), most properties are going to be located next to a street and may not be able to offer rooms with scenic views. 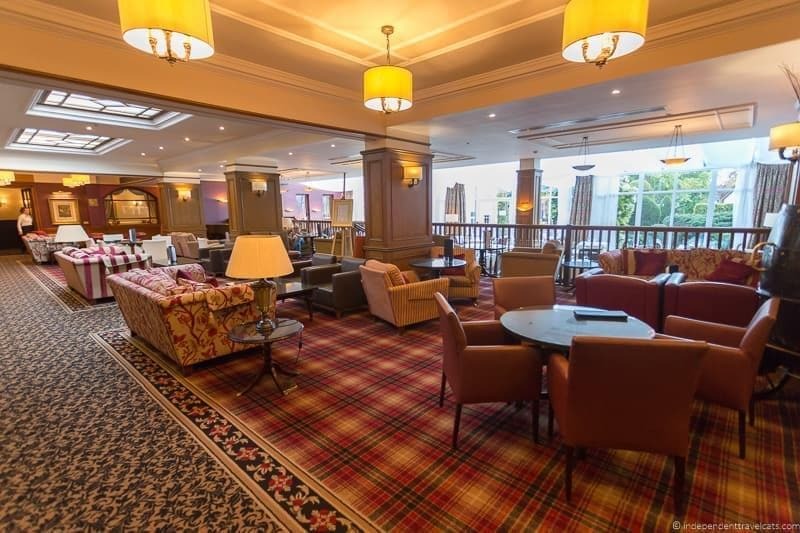 The Kingsmills Hotel is a 4-star luxury hotel located just 20 minutes from the Inverness Airport, boasting two restaurants, a whisky bar, a leisure club (gym and pool), a spa, and six different types of room choices. The hotel took its name from a former medieval grain mill that once sat on the same site, and part of the main building of the Kingmills Hotel is over 200 years old. The hotel furnishings mix the contemporary with the historical. Offering golf packages for 5 Scottish golf courses, the hotel is perfect for golfers as it sits next door to the Inverness Golf Club which we were able to see from our balcony. As noted the hotel offers a variety of different room types, but we actually stayed in the Kingsclub rooms which are exclusive rooms in a more modern building that are designed for guests who want a more quiet and secluded experience. Perks of these rooms include a complimentary welcome drink, complimentary tea and coffee, access to a private lounge, luxury bathroom products, fluffy robes, a cooked-to-order breakfast, and a number of other little extras. We had a very delightful one-night stay here with a refreshing welcome drink and a tasty Scottish breakfast. 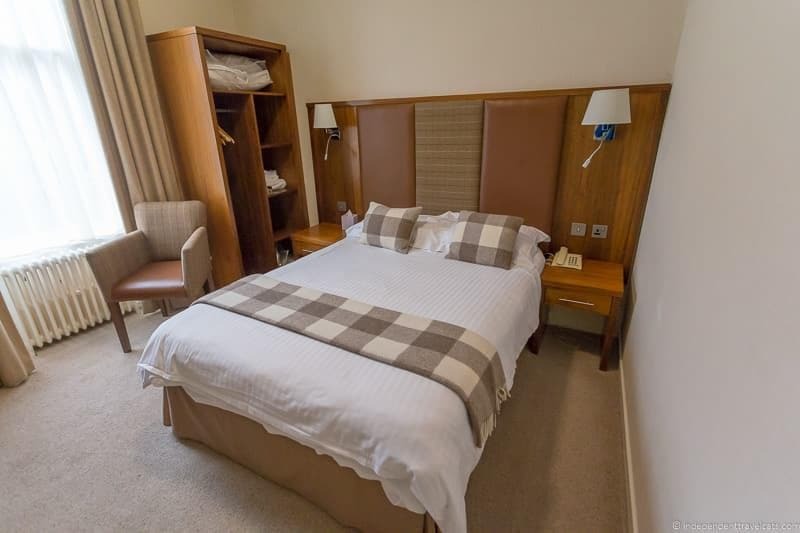 Price: Room rates typically range from £80 – £280 per night for double occupancy, with Classic rooms being the lowest priced and Kingsclub rooms being the most expensive. 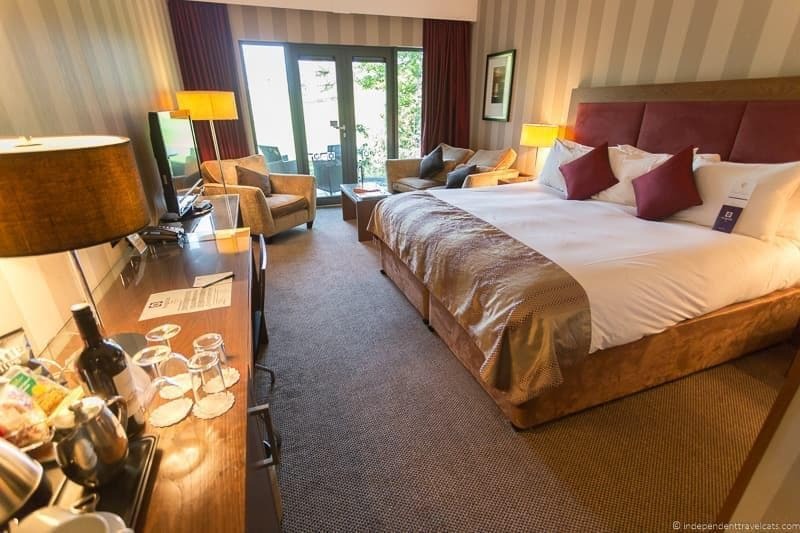 Check Kingsmills Hotel prices here and book online. Location: Hotel is located about 20 minutes from Inverness Airport and a 10 minute drive from the main central Inverness attractions. Great spot for golfers as it is located right next to the Inverness Golf Club. Tips: The Kingsmills Hotel has a lot of rooms, so if you are looking for something specific (e.g., view of golf course, ground floor Classic), I would call to request it as they can probably find something for you. If noise bothers you, ask for a room furthest from the road. Book in advance for best prices. The Rocpool Reserve Hotel is a 5-star luxury hotel located in a beautifully renovated Georgian mansion house in Inverness. The property offers an experience that is a mix between a bed-and-breakfast and a full-service hotel. Offering 11 rooms across four categories, this chic boutique hotel with modern decor is perfect for anyone looking for a refined getaway. Amenities include large beds, deep baths, rainshowers, luxury bathroom products, Egyptian cotton bedlinen, and velvet bathrobes and slippers. Some rooms have a private outdoor terrace or balcony with hot tub. The hotel also has a stylish cocktail bar and popular restaurant. We did not stay here, but had drinks at the bar and dinner at the hotel restaurant Chez Roux and can highly recommend the food and service here. 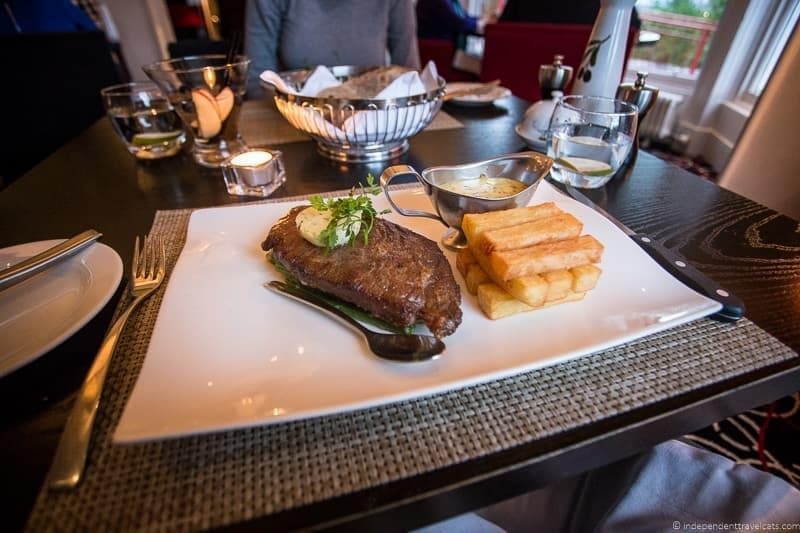 The chef uses fresh Scottish ingredients to make dishes with a French twist, and even if you are not spending the night here, we’d recommend making a reservation if you are looking for a nice dinner out while in Inverness. Price: Room rates typically range from £200 – £400 per night for double occupancy. Check Rocpool Reserve Hotel prices here to find the best rates. Location: Hotel is located about a 20 minute drive from Inverness Airport and about an 8 minute walk from the center of Inverness. Great location to feel a bit out of the center (we saw deer here in the morning) but within a quick walk of all the central Inverness attractions. Tips: Book well in advance, especially in the summer months. Even if you can’t stay here, highly recommend stopping by for a cocktail in the bar and/or a meal in the restaurant. Also note that there is a similarly named Rocpool Restaurant (unrelated to the hotel) in the city center of Inverness on Ness Walk, so just be sure you head to the correct one! 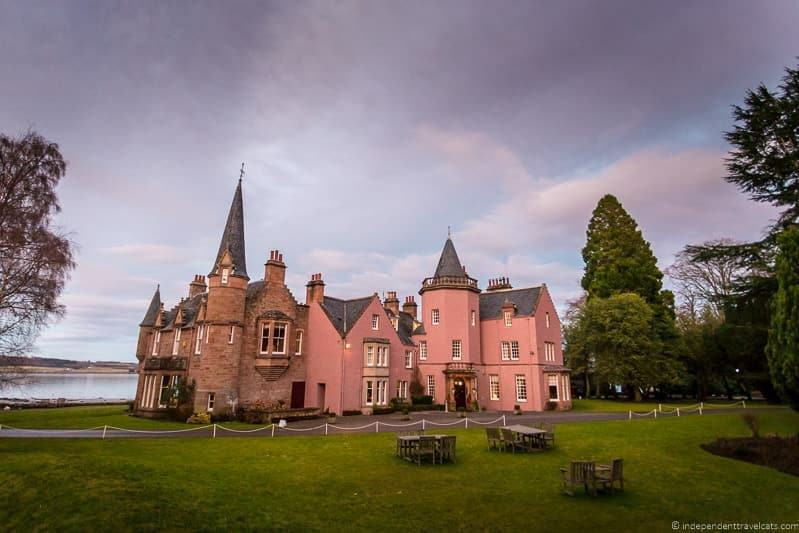 The Bunchrew House Hotel is a 4-star luxury hotel located in a partially pink 17th century baronial country home. It is located just outside Inverness, and has a wooded riverside location along the Beauly Firth. This full-service country house hotel offers 16 guest rooms. Rooms are individually decorated and offer modern amenities. Some rooms have four poster beds and/or whirlpool baths. The hotel also has a popular fine dining restaurant, bar, and lounge area. The hotel is beautifully situated out of the city for a peaceful stay and it offers nice views on a good weather day. A great place for couple looking for a romantic break. We did not eat dinner here as we had already had dinner prior to arrival and we arrived too late to have afternoon tea. We did order sandwiches, enjoy drinks in the lounge, and had breakfast the next morning, but we wish would have had dinner here as well as other guests had really good things to say about the food. Next time! Price: Room rates typically range from £129 – £480 per night for double occupancy. Rates are much higher in the summer months. Check hotel prices here to find the best rates. Location: Hotel is located about a 25 minute drive from Inverness Airport and about a 10 minute drive from the center of Inverness. Great location for those with a car who want to be a bit out of the city but still within close reach. Tips: The food is well rated here, so we’d recommend enjoying dinner if you stay here. If you enjoy traditional afternoon teas, this hotel serves one of the best in the Inverness area. Tea is available to both hotel guests as well as non-guests (reservations needed), just be sure to book you tea time in advance. If you fancy self-catering apartments, houses, cottages, or private rooms during your North Coast 500 trip, I’d recommend checking out apartments on Booking and Airbnb (if you haven’t used it before, you can read our Airbnb review here, plus you can get up to $100 off your first AirBnB booking with this link). You can also check out our list of Airbnb alternatives for other websites to check. Apartments and spare rooms along the North Coast 500 are not as plentiful as they are in other parts of the UK since most of this stretch is through small towns and countryside but you will find them scattered along the route. Staying in cozy bed-and-breakfasts, historical properties, and luxury castles was part of the experience we wanted on our North Coast 500 journey, so we didn’t use Airbnb much. However, we did use it for one night in Inverness, and as the largest city in the Highlands, it is where you’ll find the most options. We also used it for a 3-night cottage stay along the West coast. But even most of the hotel booking sites like Booking share apartments and you can search for them here. Prices: Many properties on Airbnb range from £45 to £150 per night, with private rooms being the most common type of accommodation being available. For self-catering holiday homes, properties are often rented by the week and most range from between £250 to £2,000 per week. Location: Various locations along the North Coast 500 route, but the highest number and most variety of properties are located in Inverness and surrounds. Tips: Carefully read descriptions and reviews on any booking site to minimize surprises. Also, double-check the location before booking as some properties may be a good 1 hour drive from where you want to be as some of the roads require slow speeds. Finally, we’d recommend booking in advance of your trip. Although many people book Airbnb properties fairly last-minute, your choices will likely be pretty small if you wait, especially if traveling between May and August. 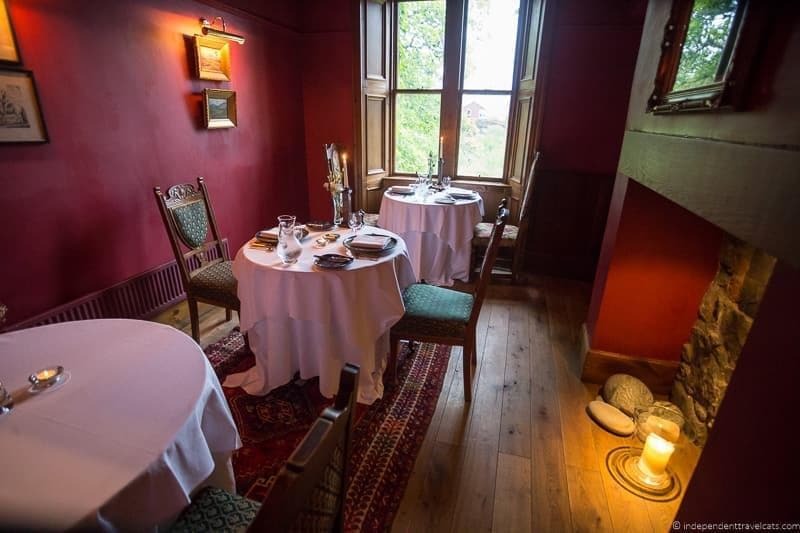 Boath House is a 5-star luxury country house hotel with a Michelin starred restaurant located about 20 minutes east of Inverness along the Moray Firth coast. Some of the buildings on the property date back to the 16th century although the main house was built in the nineteenth century and is a Grade A listed Georgian Mansion. The hotel offers nine well-appointed rooms and is known for its changing collections of contemporary art. 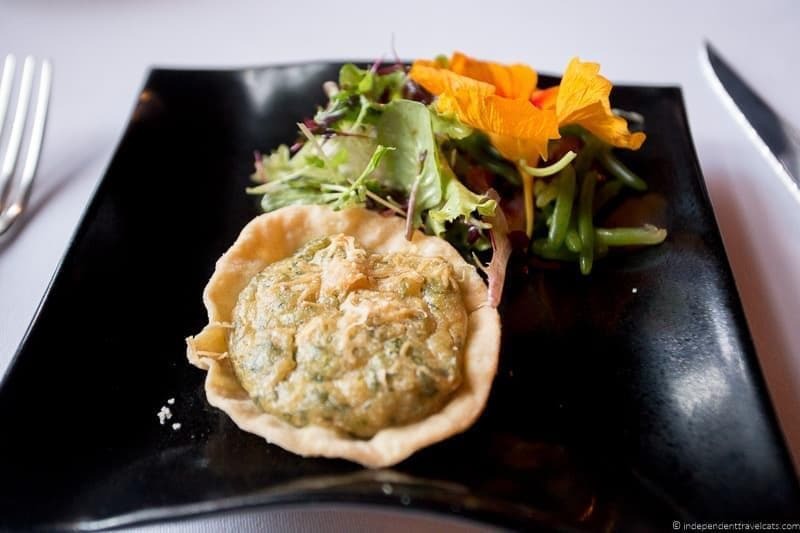 The restaurant highlights local and foraged ingredients and accepts booking for non-guests. The 22 acre estate also has an ornamental lake, streams, and beautiful walled gardens. We didn’t stay here but we did visit and during our short visit we accidentally met one of the owners and her son, who were both hard at work on the property. It was clear to us that this family-run hotel is intimate, relaxed, and there is a great attention to detail here. The staff can also arrange bespoke tours for guests. 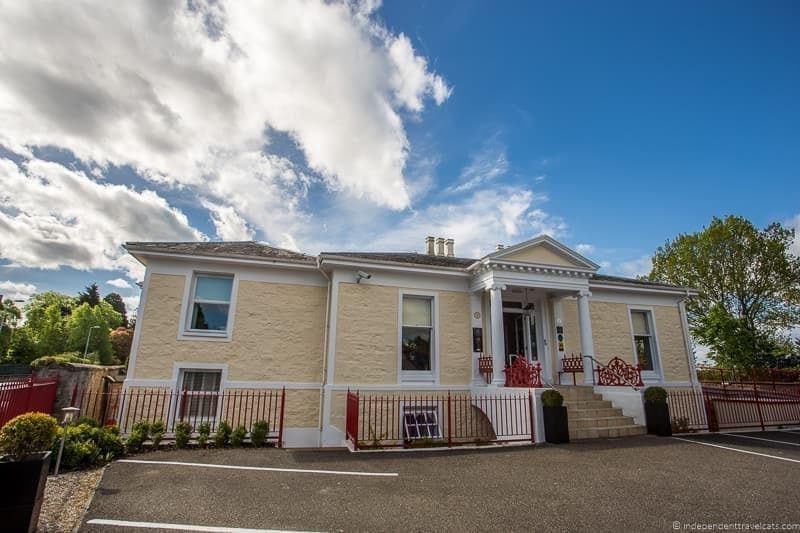 The location is not ideal for those wanting a central Inverness location, but is a beautiful location for those looking for a luxury stay outside the city. Price: Room rates typically range from £285 – £450 per night for double occupancy. Check Boath House Hotel prices here to find the best rates. Location: The hotel is about 2.5 miles from Nairn and 20 miles (35 minutes) east of Inverness. Tips: Be sure to leave time to explore the property and gardens, and I would definitely take the opportunity to have dinner here if you spend the night. 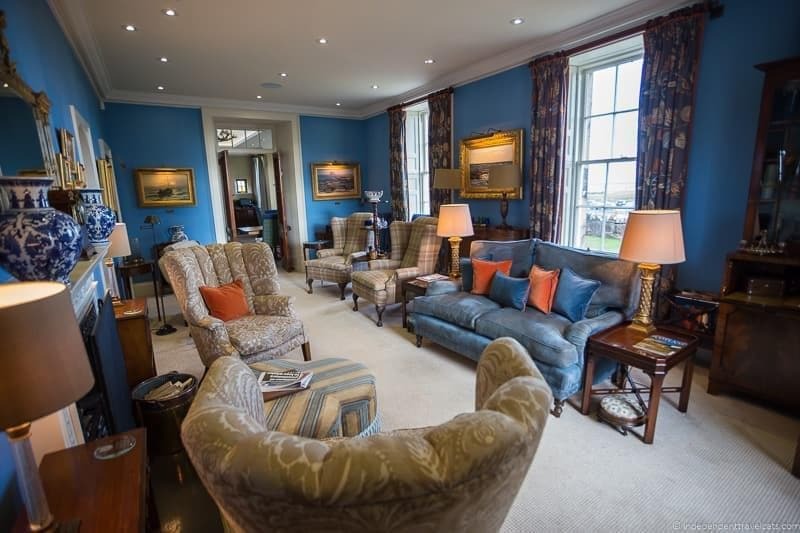 Boath House is a convenient location for visiting Fort George, Cawdor Castle, and the championship golf courses in nearby Nairn and Castle Stuart. If you are staying in Inverness, you are unlikely to need to stop on this short stretch. 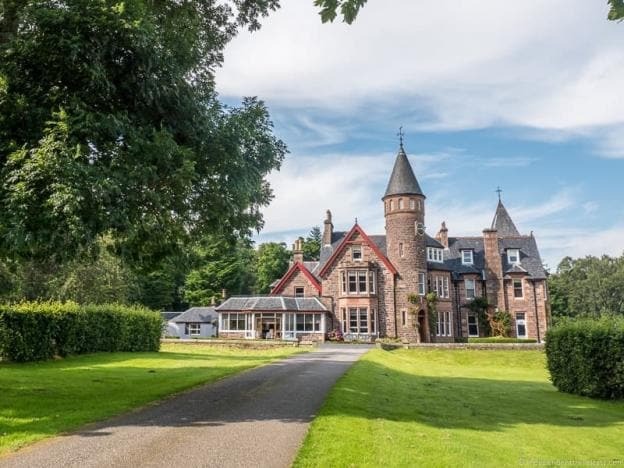 However, you may want to spend the day on the Black Isle and then head to one of these three castle hotels for the night. 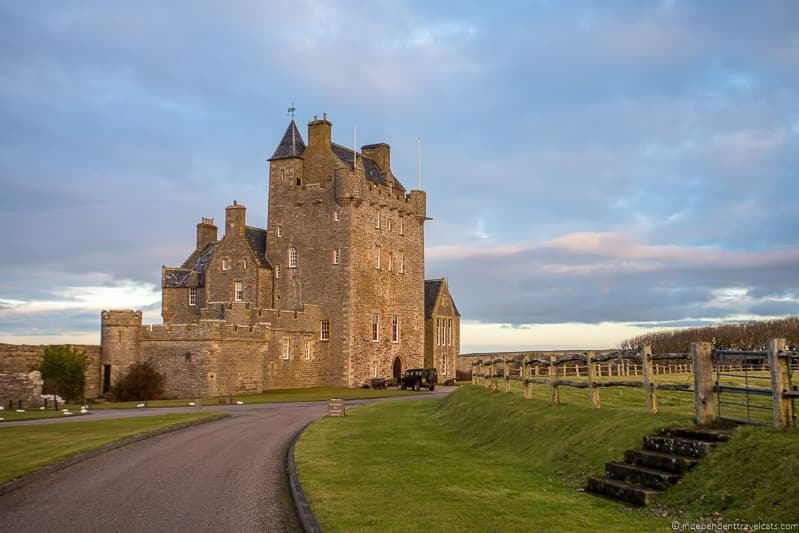 Tulloch Castle or Kincraig Castle are also well-situated for stops on the last day of your NC500 road trip and can make a great final night stay before heading into Inverness. 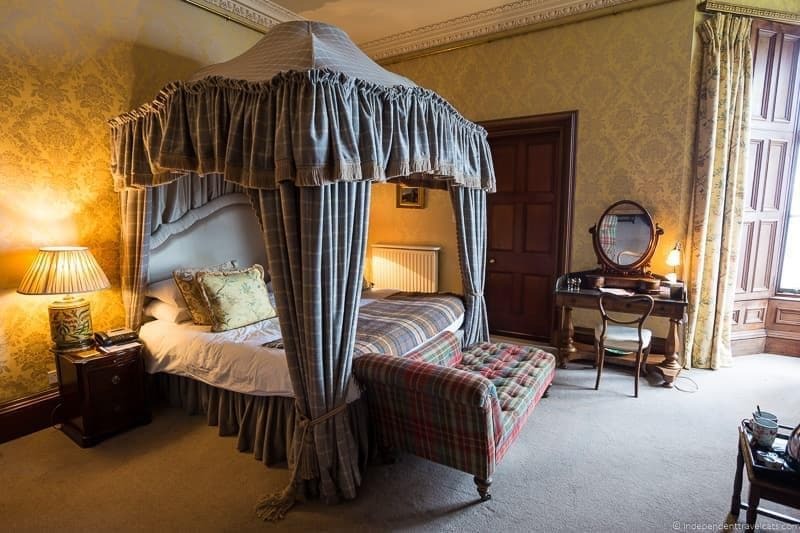 Tulloch Castle offers 20 ensuite bedrooms to guests in a former castle with sections dating back to the 12th century. Originally the home of the Bain family, the barons of Tulloch, it is best known as the former seat of Clan Davidson and today houses a small Davidson museum that contains information and artifacts from the clan. The castle has a lively history and you can uncover a lot of interesting stories and tales during a stay here. The castle has been significantly rebuilt and remodeled over the centuries but still retains many historical features such as original fireplaces and fixtures, a 250-year-old Great Hall, and a small “dungeon room” used for intimate dinners and meetings. The hotel also has a full-service restaurant, a bar, and a reception lounge with a fireplace. This is not a luxury castle hotel, but it is has a lot of ambience and is in the process of a major renovation to modernize all its rooms. We enjoyed our night here and felt it was good value for a stay in such a historical property. Price: Room rates typically range from £90 – £200 per night for double occupancy. Check Tulloch Castle Hotel prices here to find the best rates for your dates. Location: The hotel is located in Dingwall, about 2 miles from the town center. It is about 16 miles (~30 minute drive) north of Inverness. Tips: The lowest priced rooms are good value (often under £100), but these rooms are fairly small and cozy (see our photo). If you are looking for the best and largest rooms, ask for one of the 4-poster bed rooms or the apartment. 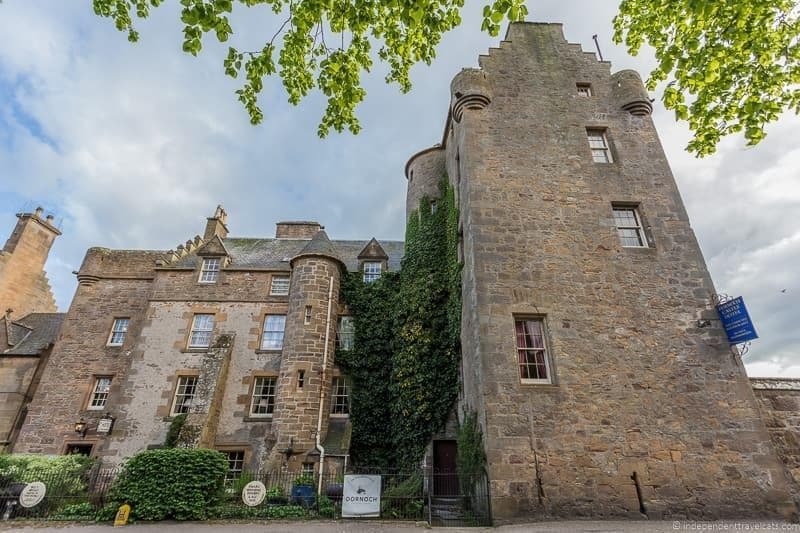 Even if you are not staying here, if you are a Davidson, be sure to stop at the small Clan Davidson museum at Tulloch Castle as it is worth a look around. The museum is normally locked but someone at reception can let you inside. Dingwall is a good place to stop for food, fuel, and other services and there is also the Dingwall Museum, a small town history museum run by friendly volunteers. 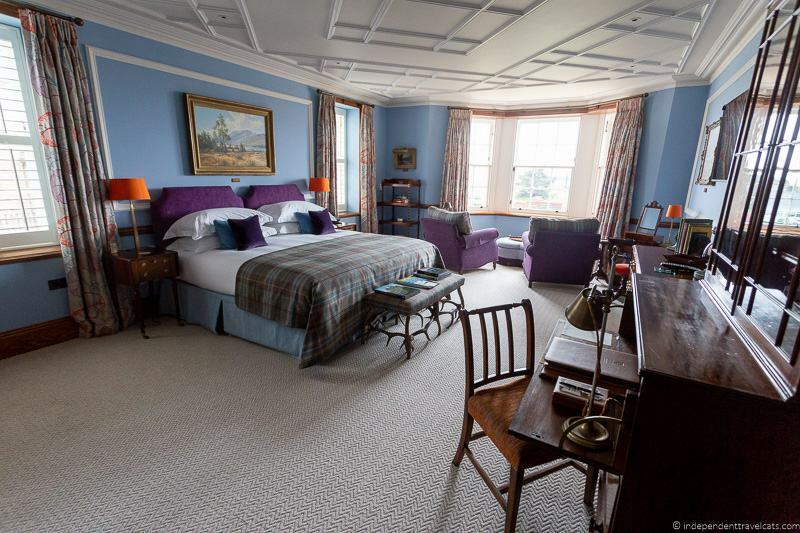 Kincraig Castle Hotel is a 4-star hotel set in an early nineteenth century castle. The castle was once the ancestral seat of the Clan MacKenzie, and the estate dates back to the early seventeenth century. The sandstone exterior of the Kincraig Castle was converted into the white-harled Scottish baronial building of today in the early twentieth century. The hotel’s 15 rooms blend traditional Scottish with contemporary decor with some rooms offering unique elements such as fireplaces, turreted details, and antique 4 poster beds. The hotel also has a well-rated restaurant (open to non-guests), a bar, and a guest lounge. We didn’t stay here but stopped by and were greeted by a very friendly staff member who told us about the history of the castle and also showed us a few of the beautiful rooms and well-tended grounds. It struck us as a well-maintained and comfortable hotel, and our stop made us wish we had an extra night along the NC500 to stay the night here. Price: Room rates typically range from £120 – £300 per night for double occupancy. Check Kincraig Castle Hotel prices here to find the best rates for your dates. Location: The hotel is located just off the A9, about 3 miles from Invergordon. It is about 23 miles (~35 minute drive) from Inverness. Tips: Be sure to book a room in advance, especially if looking for a certain type of room during the summer. Even if you don’t spend the night, you might consider booking a meal here or stopping in for a drink, especially if staying around Invergordon. Mansfield Castle Hotel is a traditional county house hotel set in a 19th century Victorian castle hotel. The hotel offers 19 rooms that are individually decorated and set about in a maze of hallways. Rooms are each individually decorated and offer a mix of traditional and contemporary decor. The hotel also has an on-site restaurant and bar. We had a comfortable stay here and had a pub style dinner in the hotel restaurant. It is not a luxury castle hotel but we had a very comfortable stay and the property is well-situated off the road with landscaped gardens away from the town center. But it is also close enough that you can easily walk into town. Price: Room rates typically range from £120 – £249 per night for double occupancy with breakfast. 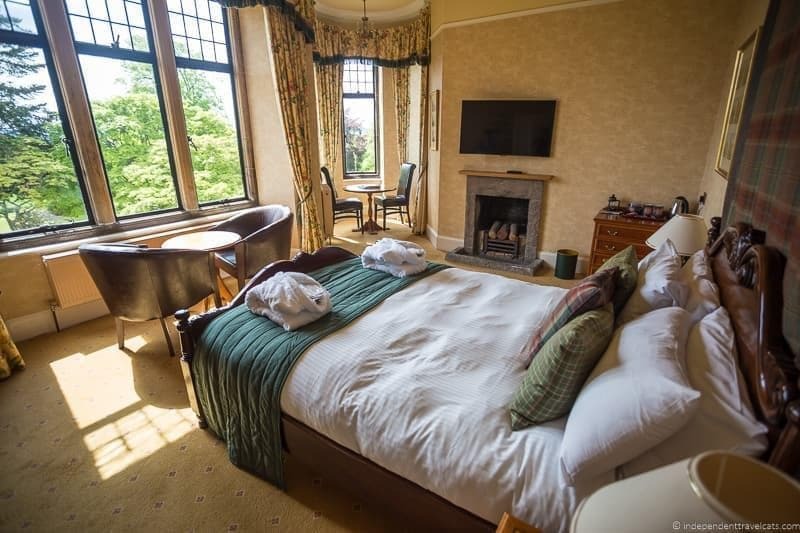 Check Mansfield Castle Hotel prices here to find the best rates for your dates. Location: The hotel is located within the small town of Tain, a 8 minute walk from the town center. It is about 35 miles (~50 minute drive) from Inverness. Tips: If you want the best room, you can pay a little extra to book the “Executive Room” (also known as the “honeymoon room”). The Tower Room is great for families. You can easily walk into Tain from the castle where you’ll find a small museum (Tain Through Time), a couple of places to eat, a small supermarket, and a Tesco. 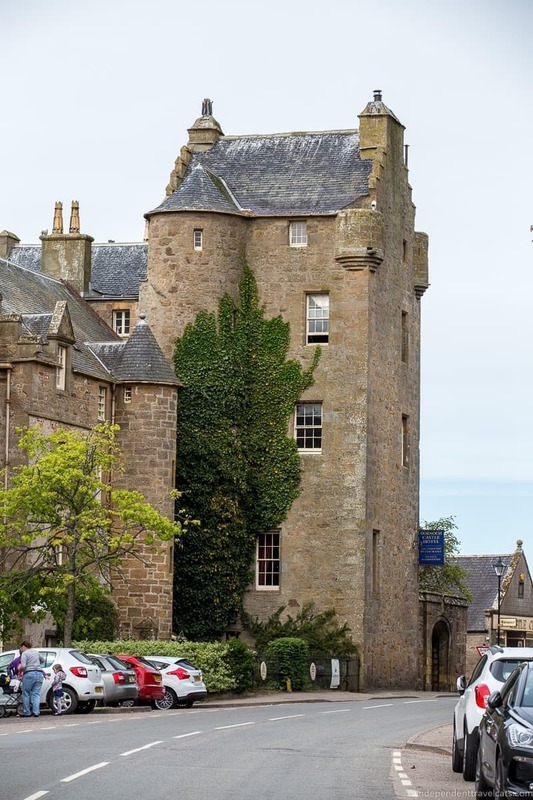 Little Dornoch is a great place to overnight with a grand old cathedral, castle, and walkable city center. It is also home to one of the oldest and best-rated golf courses in the world. 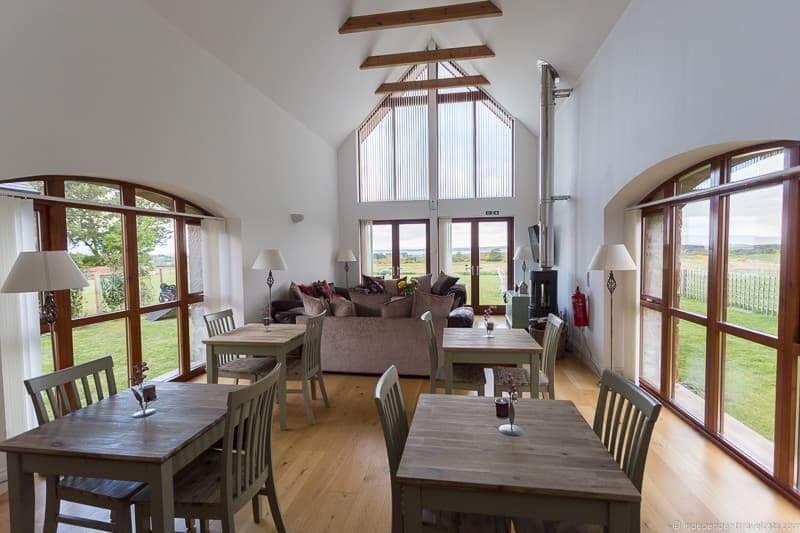 The Steading is a bespoke B&B in Balnapolaig located in a restored 150 year old grain barn that was formerly located on the Duke of Sutherland’s estate. 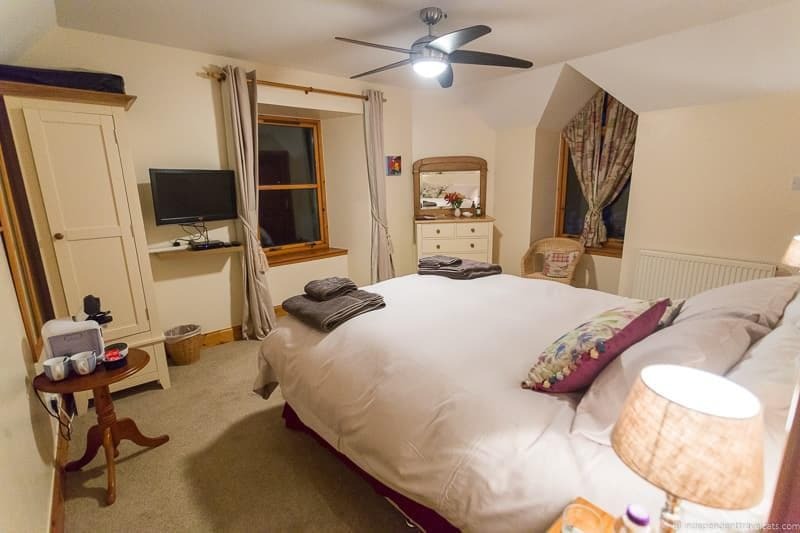 This B&B sits just outside Dornoch in a semi-rural location with some wonderful bucolic views. The eight rooms feature comfortable kingsize beds, flat screen TVs, bath robes, mini bars, and writing desks. The guesthouse also has a guest laundry area and a large public lounge and bistro dining area where coffee and tea facilities are always available. Rooms come with a cooked-to-order breakfast and we found this to be a great start to our morning. The guesthouse is run by Australian couple Stephen and Jayne and it is their attention to detail and wonderful hospitality that really makes this B&B a great place to stay. They go out of their way to try to ensure that guests have a pleasant stay and this is the place that felt the most like home during our North Coast 500 trip. When we stayed, the owners were cooking both breakfast and sometimes pre-booked evening meals. But they have since expanded their bistro dining area, hired a professional chef, and expanded their evening dining options. Makes us want to return for dinner! Highly recommend for those looking for good hospitality and a bit of respite. Price: Room rates typically range from £100 – £150 per night for double occupancy. Check The Steading prices here to find the best rates. 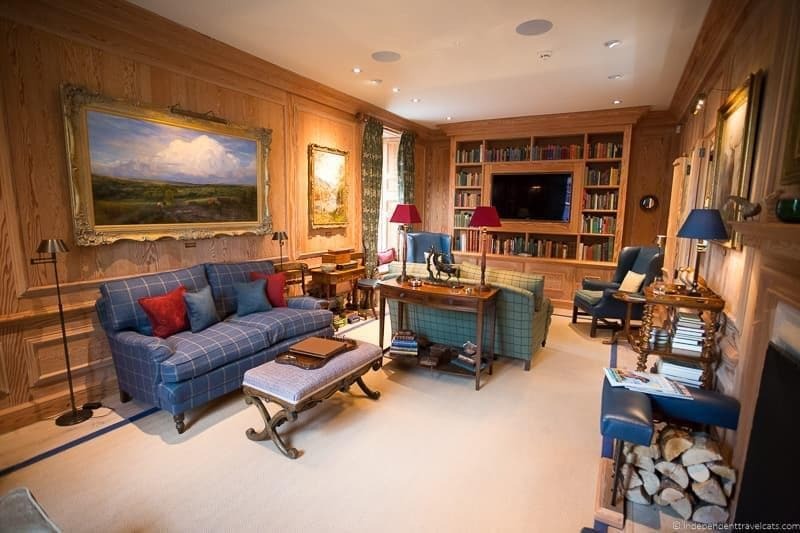 Location: A 5 minute drive from Dornoch and the world-class Dornoch Championship Golf Course. Tips: Book early as with only 8 rooms, they are often fully booked weeks in advance, especially in summer. 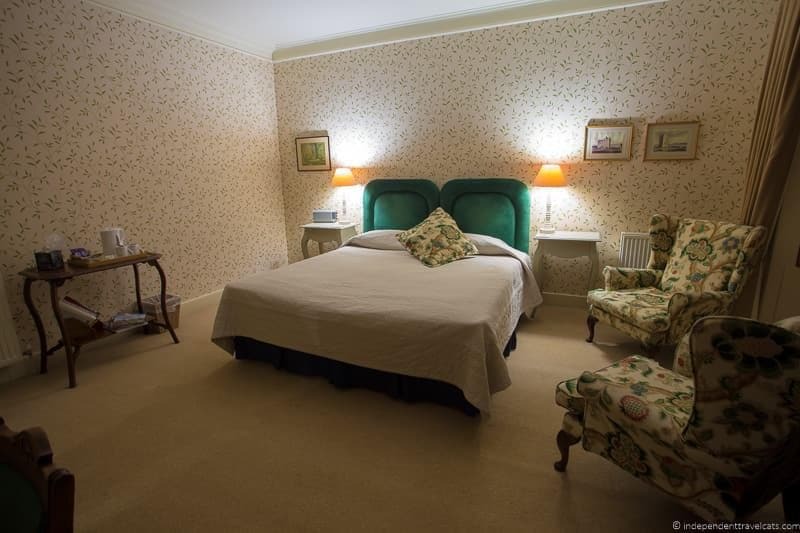 If you love really spacious rooms, book the large Cathedral Room or one of the self-catering cottages. For those looking for a quiet night in, consider having dinner here at the bistro. The owners can also help arrange airport and minibus transport, just ask in advance. The Links House is a 5-star luxury hotel that has won awards for being one of the best luxury hotels and golf hotels in the Scottish Highlands. 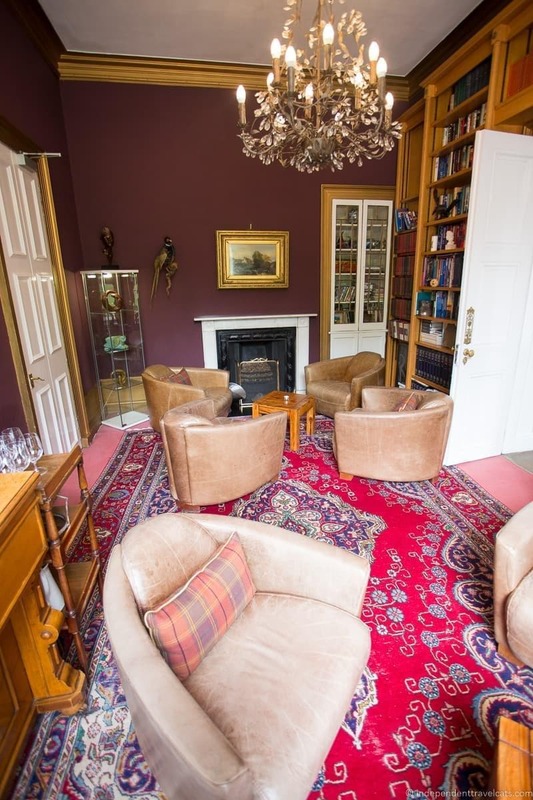 Here you’ll find beautiful public rooms full of tartan, period antiques, vintage sporting equipment, and artwork that will make you think you’ve wandered into a Scottish country house from the 19th century. The property has recently expanded and the now 14 rooms are situated across three buildings: a Georgian Main House, built in 1843, a former mews house, and a new building that opened in 2017. All rooms and suites include period antiques, heated bathroom floors, writing desks, reading chairs, bathrobes, and luxury toiletries. Public areas include a drawing room, wood-paneled library with a fireplace, a single-malt whisky honor bar, a garden, and Sporting Bothy for guests to store raingear and sporting equipment. The restaurant serves breakfast to guests (included in room rates), and both hotel guests and visitors can also book dinner and afternoon teas. We’ve had afternoon tea here and it was a very much needed pleasant break during a rainy day. 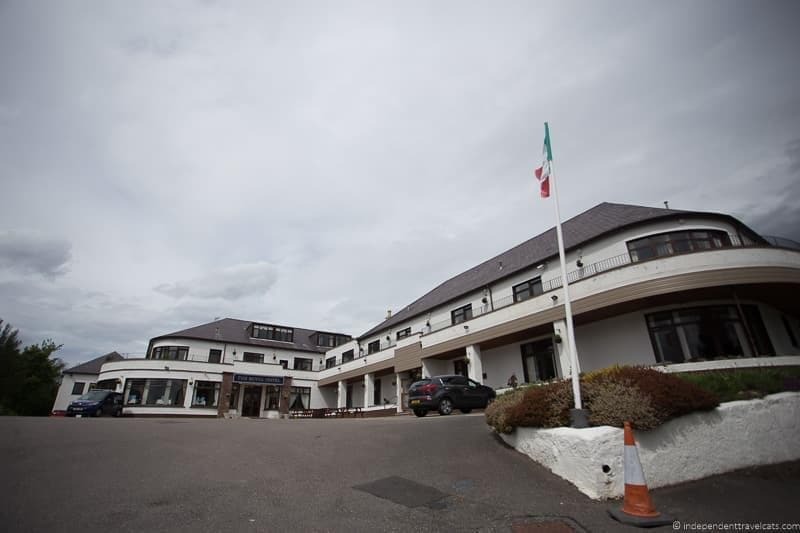 This is a popular hotel for golfers, as the hotel is adjacent to the 1st tee at Royal Dornoch Championship Golf Course (one of Scotland’s oldest and top rated courses) and you only have to walk a minute outside to start a round of golf! 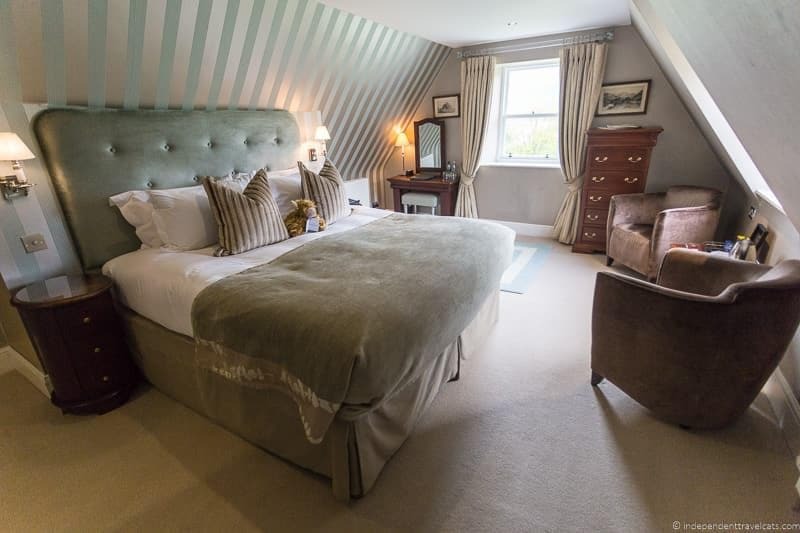 This hotel caters mainly to golfers, fishers, and hunters, but if you are looking for a 5-star stay or fine dining experience in Dornoch during your NC500 road trip Links House is your place! 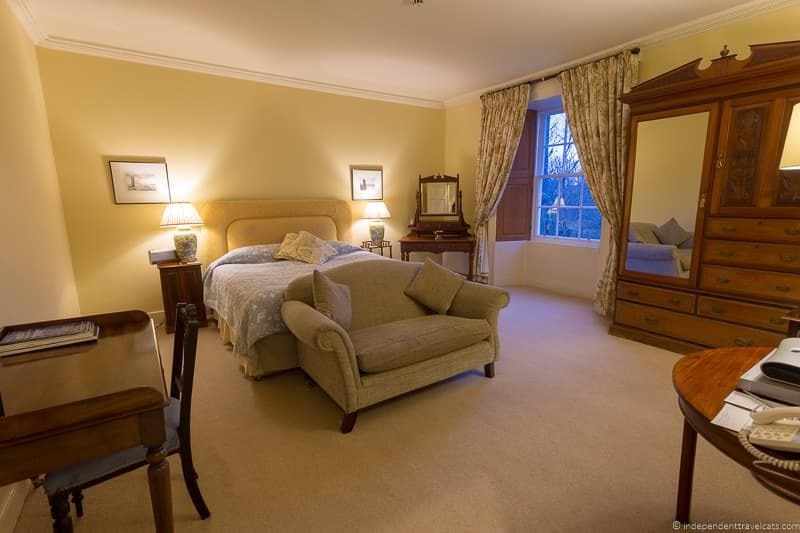 Price: Room rates typically range from £270 – £725 per night for double occupancy. Location: A 7 minute walk to Cathedral Square (central Dornoch) and the Dornoch Championship Golf Course is a 1 minute walk away. Tips: In addition to booking your room well in advance, be sure to book any tee times at Royal Dornoch Golf Club (and other area courses) to make sure you get a tee time on your date(s) of choice. If you are seeking the best room at Links House, The Mallart luxury apartment has its own private library, a peat-burning fireplace, breakfast porch, and a large bathroom suite! If the Links House is above your price range but you want to visit, the afternoon tea and dinners both get great reviews, just be sure to book in advance. 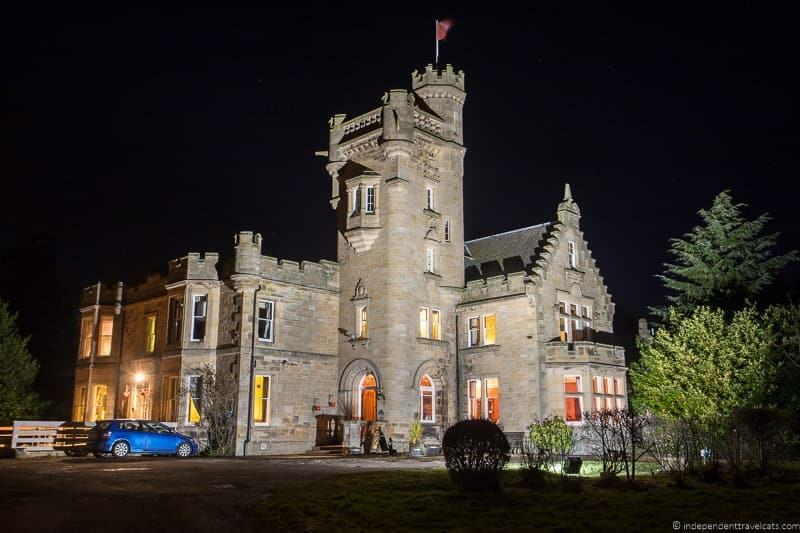 If you are looking for a Scottish castle to stay in while in Dornoch, then the 3-star Dornoch Castle Hotel is the place for you. 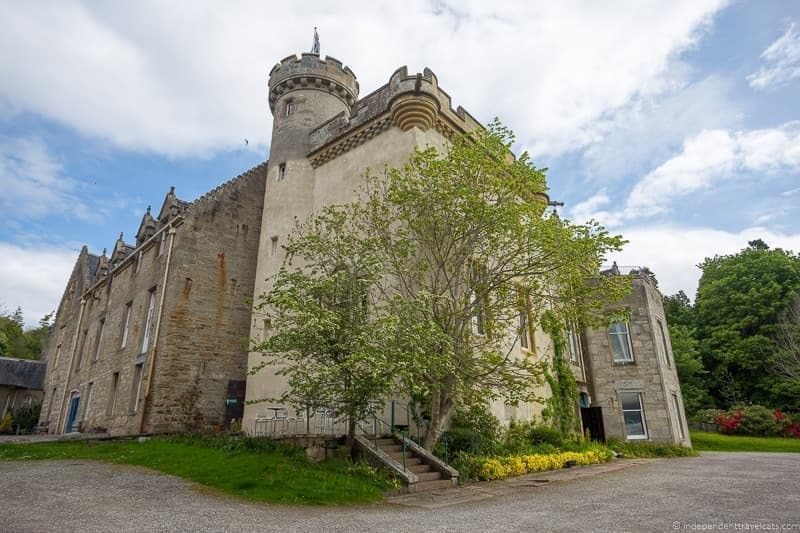 The oldest parts of this former castle are believed to date from the last 15th century and it sits right in the center of town across from the 13th century Dornoch Cathedral. The castle has quite a history and was originally built as a palace for bishops, then was the long-term property of the Sutherland family until 1922. In latter years it was used as a jail, a school, a courthouse, and other functions before being turned into a hotel in 1947. Today you’ll find 22 rooms, some in the original parts of the castle and some in the adjacent modern building with room types to suit a variety of tastes. Some are reminiscent of a castle whereas others have a modern decor, and all include all the essentials for a comfortable stay. Public spaces include the award-winning whisky bar with fireplace, an upstairs lounge, restaurant, and garden. We did not stay here but we did check out the rooms with one of the friendly staff members, and had dinner in the restaurant which we can definitely recommend (the venison was excellent!). One awkward thing about the hotel is that the reception check-in is currently located in the bar which can be crowded, so it can be a bit confusing and hopefully something that the hotel will clarify in the future. Even if you are staying elsewhere, this is one of the most lively places in town for a dram of whisky or dinner. 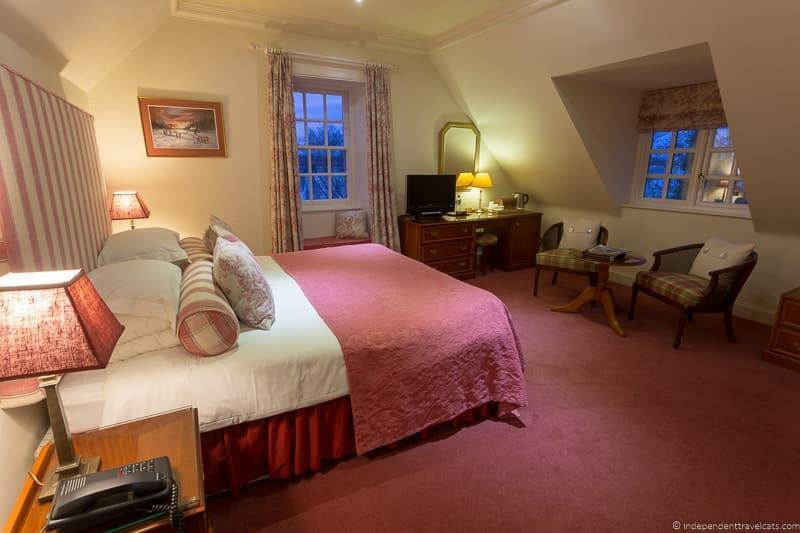 Price: Room rates typically range from £125 – £325 per night for double occupancy. Check Dornoch Castle Hotel prices here to find the best rates for your dates. Location: Located in the center of small Dornoch, right across from the Cathedral. It is an 8-minute walk or 1 minute drive to the Royal Dornoch golf courses. 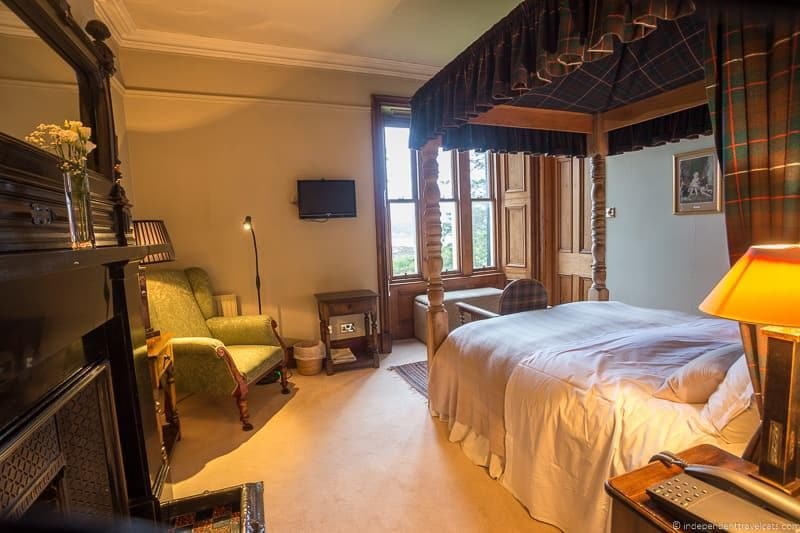 Tips: If you really want to feel like you are in a castle, I’d recommend booking the Old Courtroom Deluxe Room with its stone walls, open fireplace, handcarved wood bed, and views of Dornoch Cathedral. Note that there are a lot of stairs for the tower and upstairs rooms, and if you have limited mobility I’d recommend a ground floor or garden room. Don’t miss the Peter Pan statue in the garden, and if you want to know the full (and strange and complicated) history of the castle, ask the reception for a printout of the “Dornoch Castle Hotel brief history” (a 12 page document!). This northeast corner of Scotland is a rocky, windy coastal area with some good potential for wildlife viewing (seabirds, whales) and there are also a number of old ruins in the area. Dunnet Head is the most northerly spot in mainland Britain although many people erroneously think this honor belongs to John O’Groats. Travelers wanting to explore some of the Scottish islands can get ferries to the Orkney Islands from John O’Groats. All the towns between Wick and John O’Groats are small with limited services, but there are still several places to stop and stay along this route. Mackays Hotel is a 3-star hotel that is famous for being on the world’s shortest street (Ebenezer Place, 6 feet, 9 inches!). Built in the 19th century, this narrow hotel offers a mix of traditional and modern decor with comfortable rooms offering modern conveniences. Rooms range from singles to family rooms, and the hotel also offers a few self-catering apartments and townhouses well-suited for families. A cooked Scottish breakfast is included in hotel room rates, and the hotel has a well-rated on-site restaurant No. 1 Bistro and a bar so you can stop in for everything from coffee to dinner to cocktails. We did not stay here but did stop in for a meal while in Wick and were shown around by the friendly staff and owners who were very welcoming. Price: Room rates typically range from £120 – £170 per night for double occupancy. 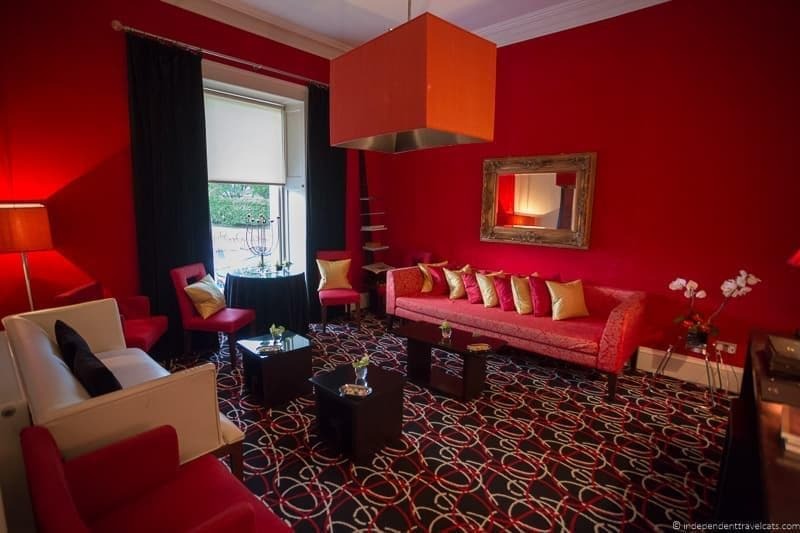 Check Mackays Hotel prices here to find the best rates for your dates. Location: Located in central Wick, and is 16 miles (about a 25 minute drive) south of John O’ Groats. Tips: There is no dedicated on-site parking, but free street parking. If you want to explore Wick, ask the reception for “Mackays Staff Guide to Wick” for some local insight into the little town. If you want to try a local award-winning whisky, Old Pulteney is distilled here and you can make a stop at their visitor center or just have a dram at Mackays Bar. 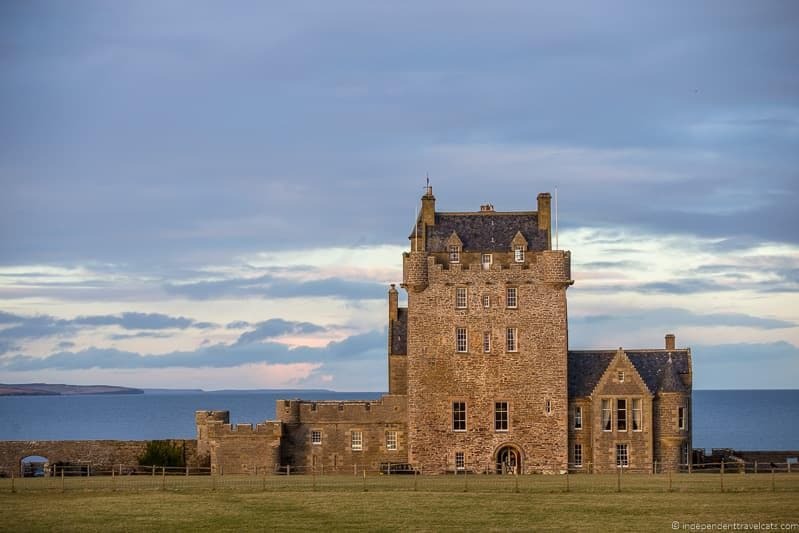 Ackergill Tower is a stunning 500-year-old castle with an exciting history of ownerships, attacks, sieges, and potential abductions with a stunning coastal location and expansive grounds. The central tower part is the oldest dating from the late 15th or early 16th century with 18th and 19th century extensions. It is the kind of place that people dream of when they imagine a Scottish castle hotel. The 5-star boutique luxury hotel offers a number of rooms in the castle as well as several self-catering properties on the grounds, including a 5-bedroom former stable and a glass-topped “treehouse” property. The rooms feature comfortable beds, a mix of traditional and contemporary decor, flat-screen TVs, old-style bathroom fixtures, bathrobes, a desk or vanity, and toiletries. Some rooms have four-poster beds, fireplaces, and views along the coast and Sinclair Bay. 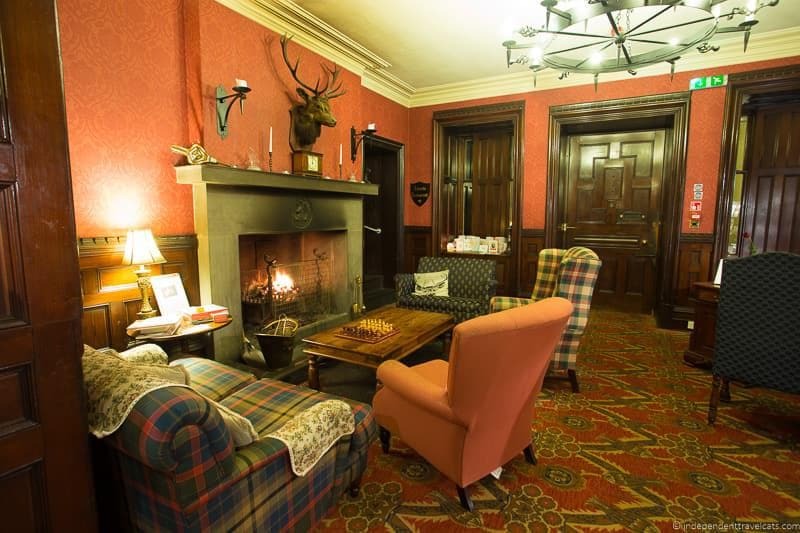 The hotel also has large public rooms where guests can read in front of a fireplace, rifle through books, photo albums, or magazines lying about, play pool/snooker, or have a coffee or dram of whisky, and these rooms made us feel like we were staying in a friend’s castle. Outdoors guests can walk along the estate or beach, or book a number of activities such as archery, mountain biking, fishing, clay pigeon shooting, evening beach bonfires, and croquet. We sadly stayed inside during our stay as the weather was terrible but we’d love to return to explore the coastline and do some of the activities on the estate. The castle also has an on-site restaurant in the Great Hall that serves breakfast to guests (included in rate for those in the Castle rooms) as well as dinner. Although the food was good at both breakfast and dinner, the service was a bit inconsistent during both meals. We were told that the management at Ackergill is currently in a transition and we did notice some minor issues during our stay not consistent with a 5-star experience, including a lack of welcome drink on arrival (just glasses left in room), slow service at breakfast, and lower quality bathroom toiletries. However, all these issues aside we were treated well by the staff, the castle itself is fun to explore, and this is probably the most scenic hotel location on the North Coast 500. Stay here for the historical property, location, and scenic views and hopefully the management will iron out all the service details soon. NOTE: Ackergill Tower “temporarily” closed to the public in December 2018 and the owners have reported they will reopen in March 2019. However, it seems that the hotel may be sold and if so, it will be NOT reopen as a hotel. The hotel is not open and is currently not taking bookings. Price: Room rates and self-catering cottages typically range from £179 – £315 per night for double occupancy. Check Ackergill Tower prices here to find the best rates for your dates. 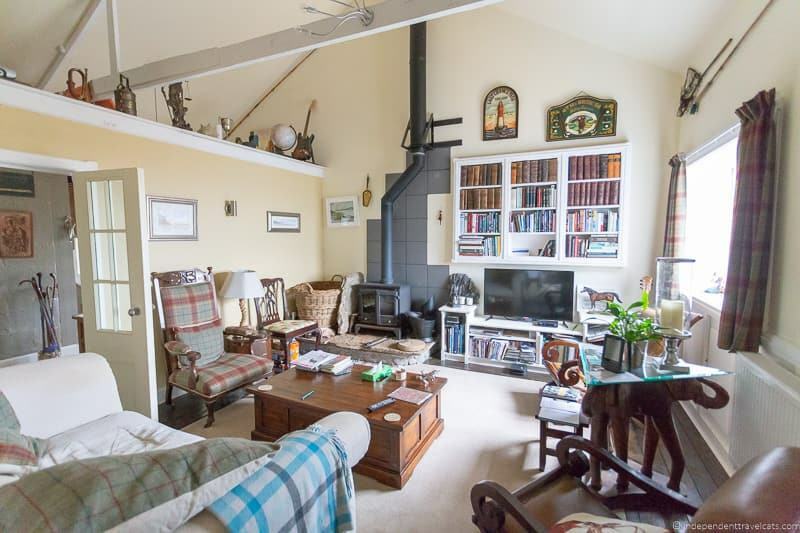 Location: Located on a large estate, it is about 3 miles (10 minute drive) from the nearest town of Wick, and it is about 15 miles south of John O’ Groats. Tips: If you are traveling as a family or with a large group (or want more privacy), I’d definitely recommend checking out the various holiday cottages. If you are looking for a short but scenic coastal walk nearby away from the estate, ask hotel staff for where to park for a walk to see the ruins of nearby Castle Sinclair Girnigoe. 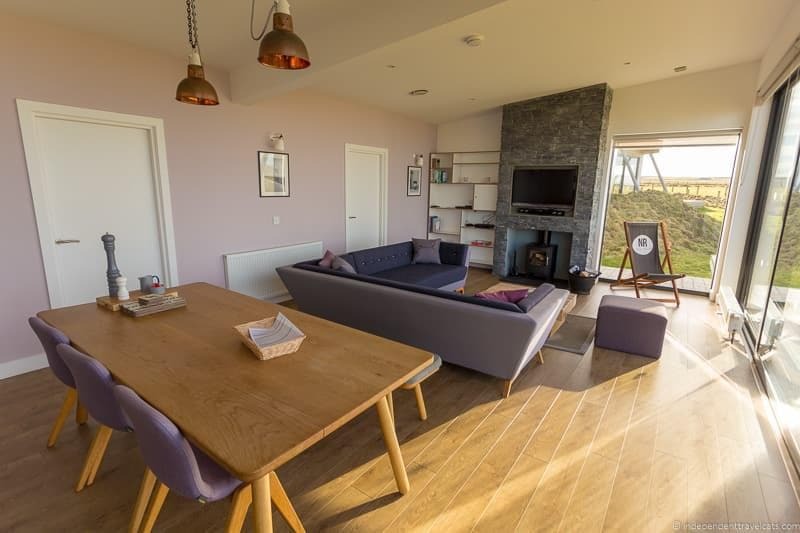 Together Travel (formerly Natural Retreats) recently opened two self-catering lodging options in little John O’Groats, a place famous for being at one end of the 876-mile “End to End” route that connects it to Land’s End in Cornwall. 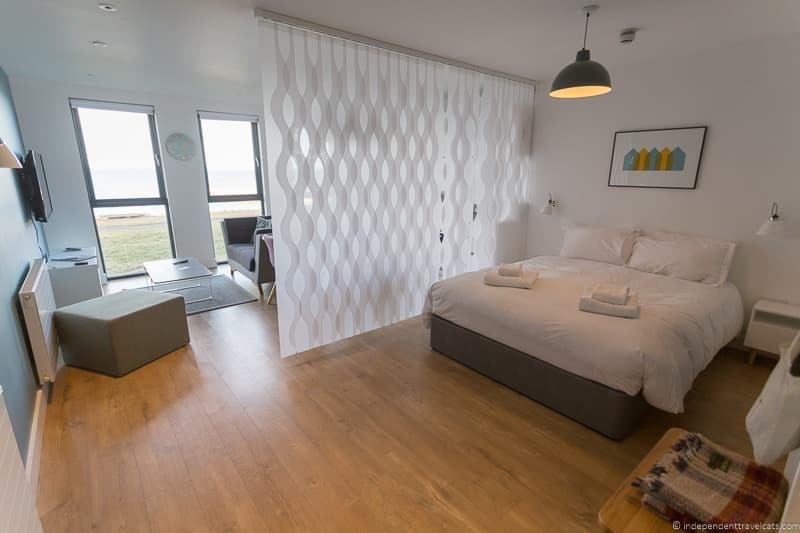 The Inn at John O’Groats, a restoration of the former Victorian-era John O’Groats Hotel, offers studios to 4-bedroom apartments, and the Lodges at John O’Groats offers newly-built self-catering 3-bedroom villas located in the field nearby. Each of the wood-lined Lodge villas offer floor-to-ceiling glass fronts for great views and many of the apartments also offer sea views. All options are self-catering with cooking facilities, but they do come with a complimentary welcome hamper containing local produce (i.e., coffee, tea, oatcakes, bread, eggs, wine) and a concierge service. Expect modern decor, locally sourced furniture, and modern technology like flat-screen TVs and Playstations. If you are not interested in cooking, you can stop into the adjacent Storehouse cafe which offers drinks, snacks, soup, sandwiches, and desserts. We’ve stopped for a hot sandwich and soup here and both were tasty. 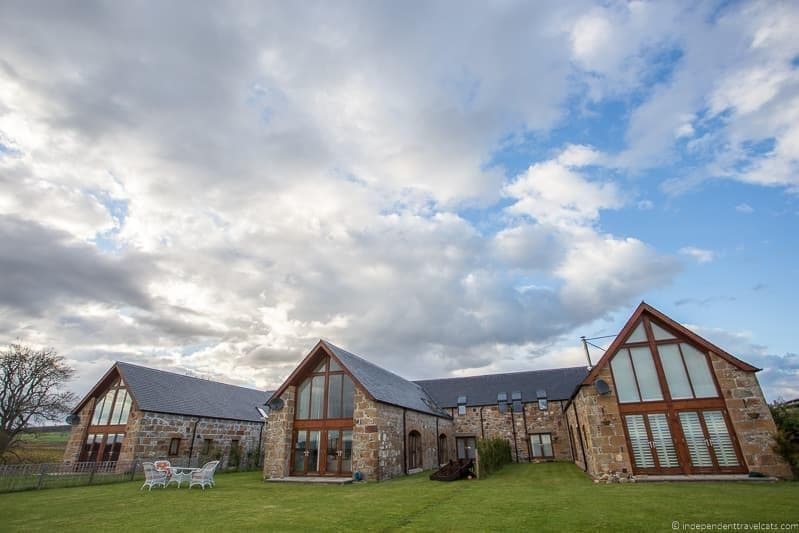 We haven’t stayed here yet ourselves, but it is a good place to consider for those looking for a self-catering option with some nice views, and a convenient location for those traveling as a family or group as well as those wanting to take a boat trip to the Orkney Islands. Price: Room rates and self-catering cottages typically range from £110 – £210 per night for double occupancy. 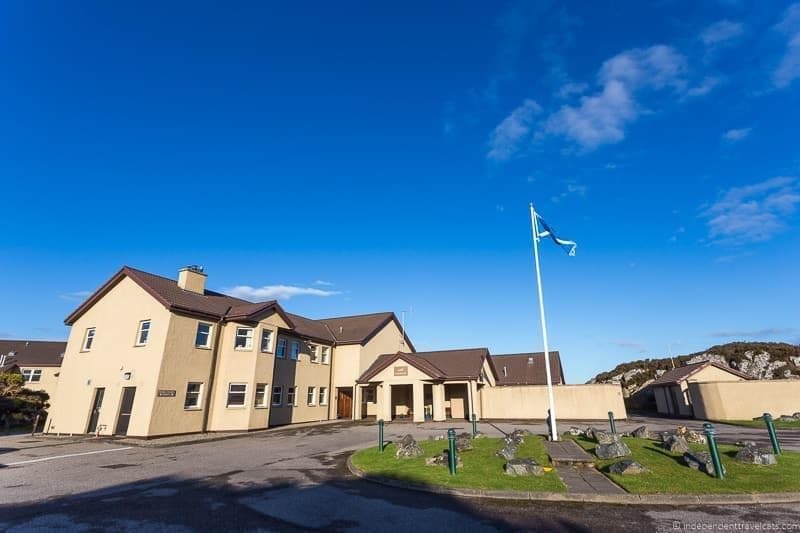 Check John O’Groats Inn & Lodges prices here to find the best rates. 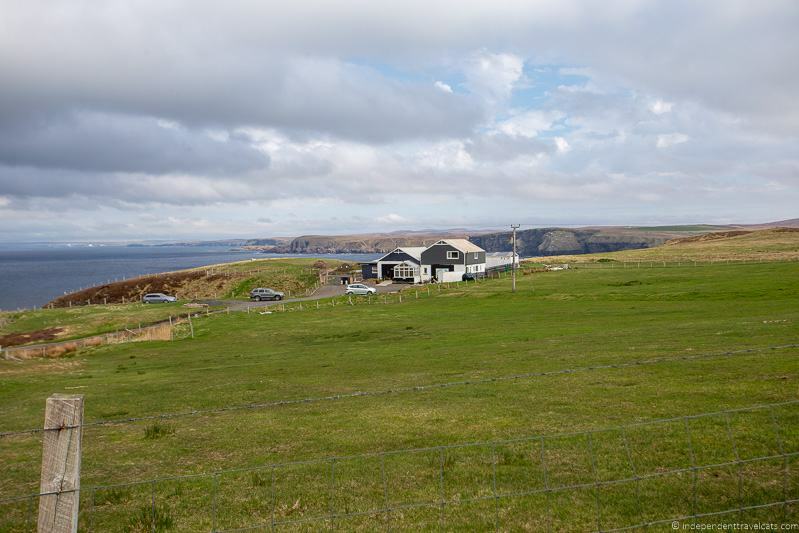 Location: Located just next to the main John O’Groats parking lot and within walking distance to the ferry to the Orkney Islands and other boat excursions. Tips: You’ll likely want to pick up any major groceries and other self-catering necessities before getting to John O’Groats as you’ll find little here except for a couple of gift shops, an ice cream shop, small farm shop, and a cafe. The Forss House Hotel is 4-star small hotel with 14 ensuite rooms spread across the main country house (built in 1810) and two nearby buildings, The River House and Fishing Lodge. Well-appointed rooms mix Victorian and Georgian elements with modern ones. The hotel has a small lounge as well as a whisky bar. The hotel is set in its own 20 acres of woodland and the River Forss runs through the estate, making it a favorite place to stay among fishermen and those seeking outdoor pursuits. 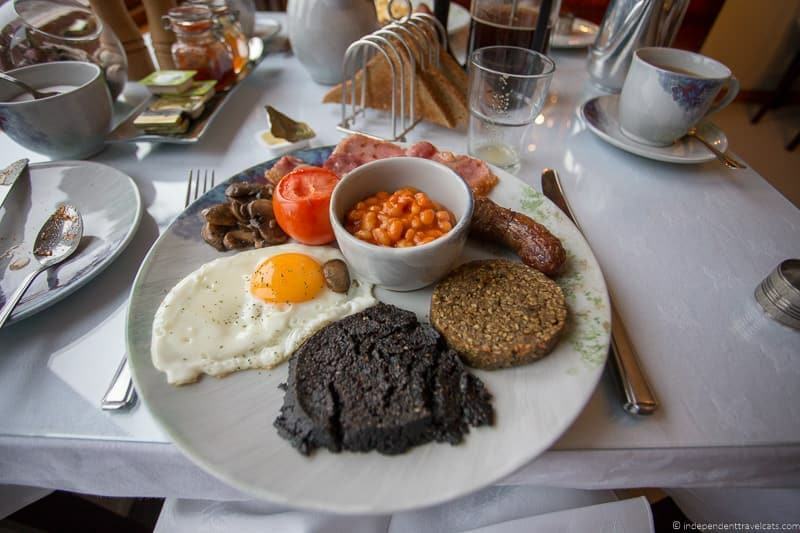 A full Scottish breakfast is included in room rates, and the hotel also hosts the best-rated restaurant in the area (open to non-hotel guests, reservations recommended). We had a wonderful stay and dinner here and highly recommend this property for those looking for a peaceful country house environment. The grounds a lovely place to walk around and it is a very great place to get away for a couple of days if you are driving the NC500. Staff were very friendly and accommodating. 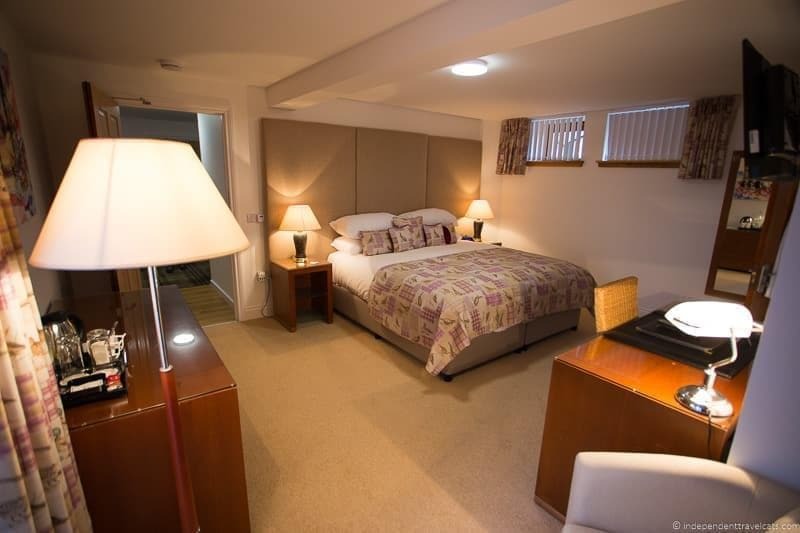 Price: Room rates typically range from £125 – £185 per night for double occupancy. Check Forss House Hotel prices to find the best rates. Location: It is located about 5.5 miles west of Thurso (about a 15 minute drive). Tips: There are a number of trails from and near the hotel with lovely river walks. If you love ruins, ask about the hike to St. Mary’s Church in Crosskirk. If are interested in fishing during your stay and don’t already have permission or a permit arranged, contact the hotel in advance to see what is possible nearby during your stay. Salmon Landings is a newly built and opened B&B (opened in late 2016) that was built from the foundations of an early 20th century salmon fishing station. It is scenically located on a clifftop near Strathy Point. 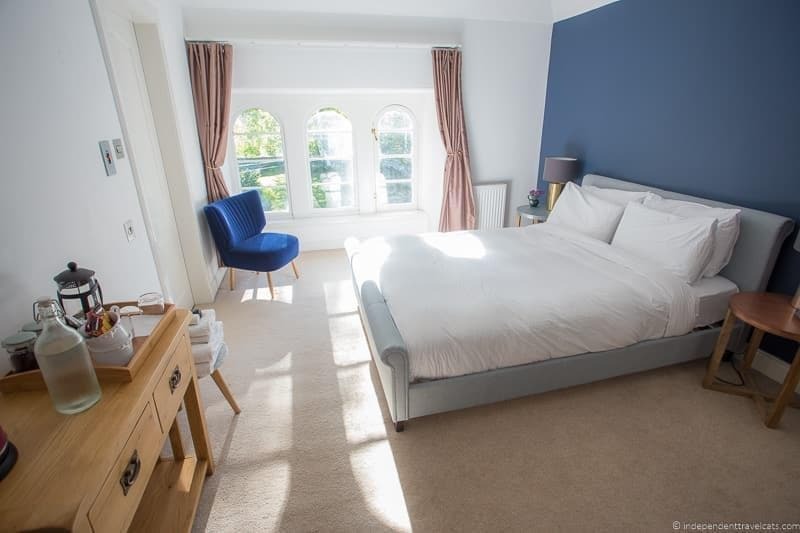 The bespoke B&B offers four guest rooms with modern amenities, which include smart TV’s, USB ports, in-room tea & coffee facilities, and down duvets. 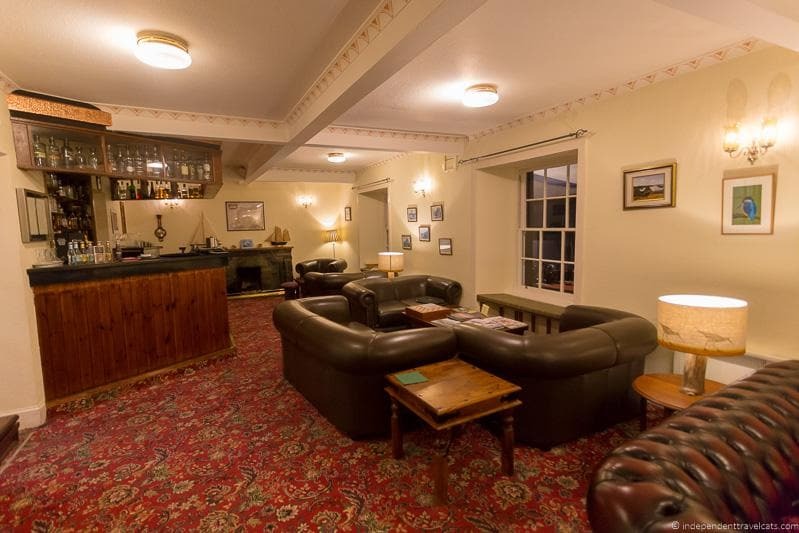 The B&B also has a comfortable shared lounge area with a TV, games, and magazines and a dining area. Breakfast and tea are served in the pretty new glasshouse tea room that just opened in Spring 2018. We were greeted with warm drinks by the owners, Julie and Kevan, on arrival. We were pleasantly surprised by all the modern touches (USB ports, sensor lights, smart TVs) in our room as these are not typical in the northern Highlands. 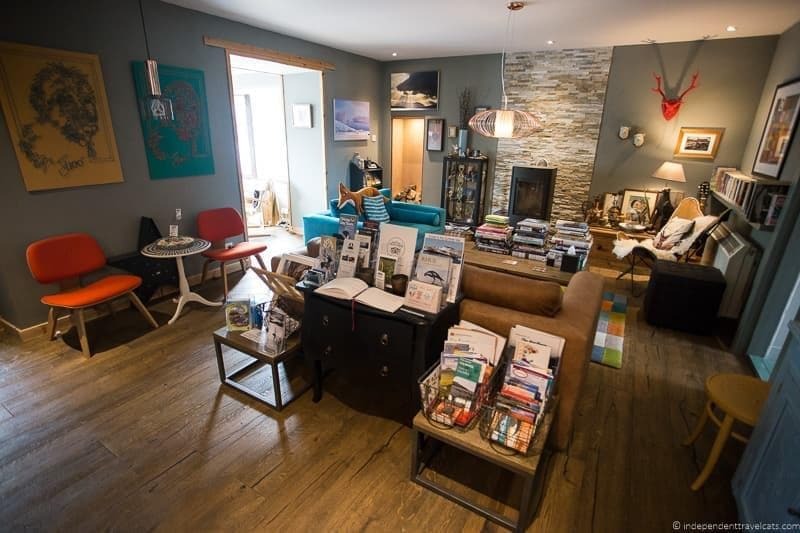 The B&B is also more spacious and modern than many Highland lodgings because the owners Julie and Kevan were able to build it as they wished although they have preserved some of the foundations and walls of the former salmon fishing station. The food here was great, both breakfast and dinner. Note that meals, other than breakfast, are not typically offered here, and that you should figure out your dinner plans prior to arrival. 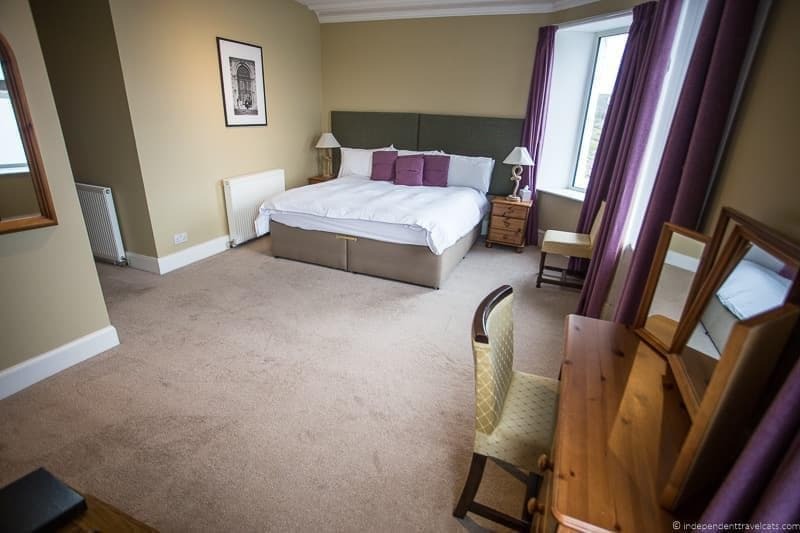 Price: Room rates typically range from £80 – £125 per night for double occupancy. Check Salmon Landings prices to find the best rates. Location: It is located about 22 miles west of Thurso (about a 35 minute drive). Tips: This location is a bit away from any major towns so be sure to think about dinner before you arrive and I’d ask the owners for recommended options during your dates of stay. The local Strathy Inn (about a 5 minute drive) has a pub and restaurant that serves evening meals; however, whenever it is closed there are no local options so you will want to perhaps eat in Thurso first. The owners are happy to provide tips to guests for things to do in the area (beaches, museums, hikes, fishing, kayaking, etc.). We recommend making time to take a walk out to beautiful Strathy Point, a good place to spot birds and marine wildlife and also a good place for stargazing in the evening. It is about a 25 minute walk from the B&B to Strathy Point and Strathy Point lighthouse, just be sure to keep children close by and away from the cliffs! The Tongue Hotel is small hotel offering 19 ensuite rooms in a former nineteenth century hunting lodge built for the Duke of Sutherland. Rooms are traditionally decorated and many include original Victorian fittings and furnishings, and some include fireplaces. A decanter of sherry awaits guests in their rooms, and there is a cozy lounge where guests can relax with drinks, read, or choose one of the many board games on selection. We played a fun game of Battleship before dinner! The hotel has a full-service restaurant and a full-service public bar. The hotel sits near the sea loch Kyle of Tongue and you can see the ruins of Castle Varrich from here, and some rooms have these views as well. We stayed here during the winter so it was very quiet here but we had a comfortable room and a good breakfast and dinner. This is a simple, comfortable, and traditional place to stay and relax. Even if you do not stay here, you may want to stop in for a drink or meal as it is often the liveliest place in little Tongue! 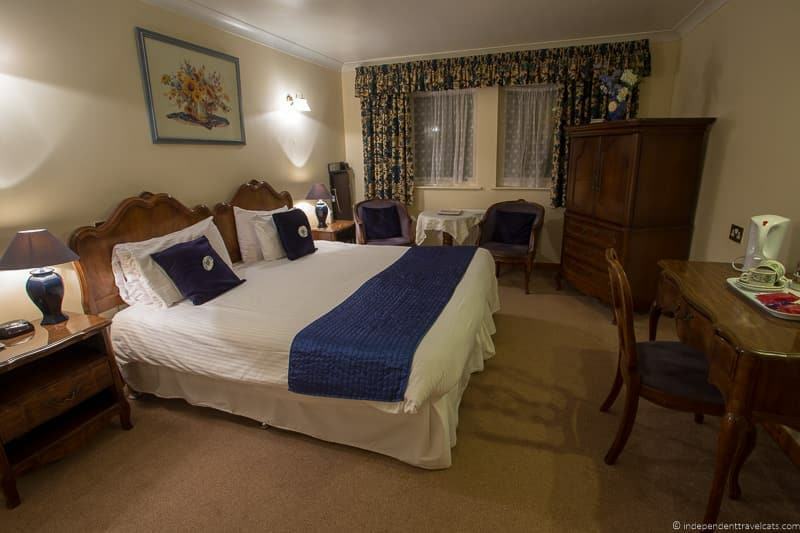 Price: Room rates typically range from £95 – £165 per night for double occupancy. Check Tongue Hotel prices online to find the best rates for your dates. Tips: Note that not all offered hotel rates include breakfast, so be sure to book the B&B rate if you want breakfast included (although you can always pay for it separately). If you want to learn a little about the history of the building and area, be sure to take a look at the memorabilia near the entrance. There are some lovely hikes and drives around the hotel, and you can ask the staff for recommendations as we did. From the hotel you can view or walk (about a 1 hour walk, some uphill parts) over to the ruins of Castle Varrich which recently was stabilized with a visitor viewing platform added. This remote area of Scotland is full of wild and rural terrain and little remote fishing and crofting hamlets. When driving the North Coast 500, you can choose to skip the road that goes off to Lochinver if you are short on time, but we’d definitely recommend heading out that way if you can as it is a beautiful area. We’ve provided hotel locations both on and off the main road. The Eddrachilles Hotel is a 10-room country hotel located in an 18th century former manse (clergy home). The hotel has recently changed owners and the rooms have been recently renovated and are designed for comfort and coziness. Some rooms have sea views. Lounge features an open fire and relaxing area for reading, and the hotel also has a bar, restaurant, and small garden area. We didn’t spend the night here as the dates didn’t work out on our most recent trip, but we have stopped in to see the hotel and chat with the owners. This is a very comfortable place with a pretty garden, and we recommend staying here if you are looking for a cozy typical Highlands hotel. Also a great place to consider for a meal if you are in the area as they are often open to non-residents for afternoon tea and/or dinner depending on the season (call to book in advance). Price: Room rates typically range from £120 – £160 per night for double occupancy. Location: Located about 3 miles south of Scourie. Tips: Lots of hiking, kayaking, beach, and adventure activity opportunities in this area. The owners are happy to give lots of suggestion for local activities and attractions. 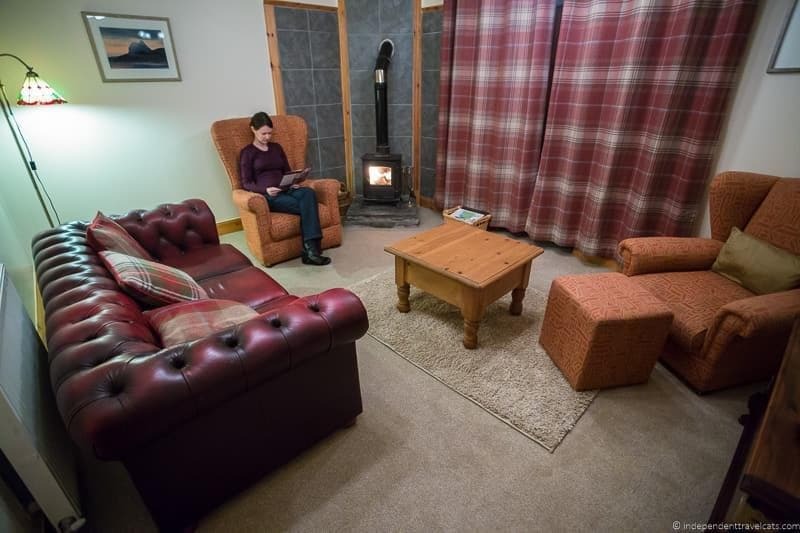 The Kylesku Hotel is a small hotel perched on the shores of a sea loch, and offers 11 rooms located across a renovated 17th century coaching inn and a new annex. The hotel is perched on the shores where Loch Glencoul and Loch Glendhu join to form a sea passage called Loch a’ Chairn, and many rooms come with loch views. The rooms have contemporary furnishings and there is a public lounge with an open fire that guests can enjoy reading and drinks and an outdoor deck and small garden. The award-winning hotel also has a bar and a popular restaurant that focuses on local seafood. Price: Room rates typically range from £110 – £160 per night for double occupancy. Check latest prices online here. Location: Located in tiny Kylesku, and about 10 miles from Scourie and 18 miles from Lochinver. Tips: Ask for a balcony room or head out to the deck to enjoy the sunrises or sunsets here. Great spot for those wanting to enjoy rural Sutherland. Note that there is not much in Kylesku other than a bridge and a few houses, so you’ll want to eat at the hotel restaurant or make plans to eat elsewhere (Scourie is a 16 minute drive and Lochinver is a 30 minute drive). 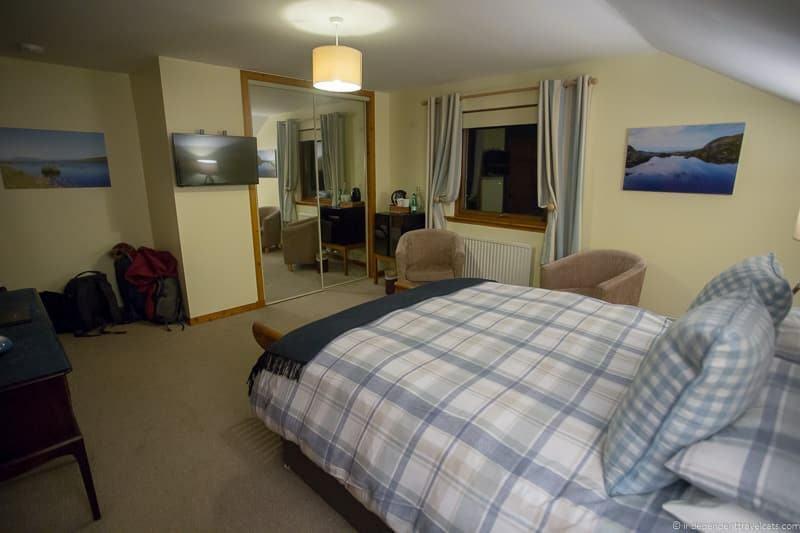 Inver Lodge is a 21-room hotel perched atop of a hill overlooking the charming little town of Lochinver and its loch. Although the hotel is not much to look at from the outside, it offers some great views, with all rooms and the restaurant having bay views. 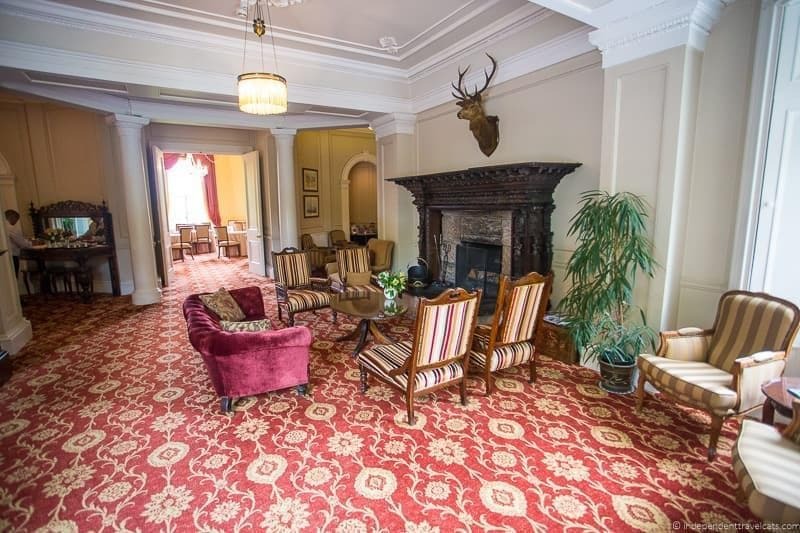 The hotel strives for understated luxury and has a foyer with log fire for guests to relax and a restaurant, Chez Roux (can be booked by non-guests as well). 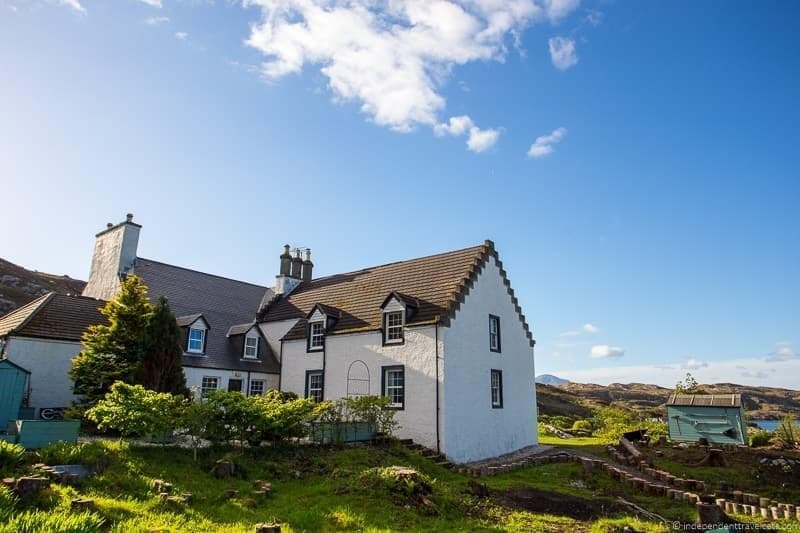 We didn’t stay here so can’t personally comment on the service or rooms, but definitely a place to consider if you are wanting to stay in Lochinver, which is a lovely spot for those looking for fishing, wildlife viewing, hill walking, and untamed scenery. Price: Room rates typically range from £270 – £580 per night for double occupancy. Check Inver Lodge prices here to find the best rates for your dates. Location: Located in little Lochinver on a hill. It is about a 12 minute walk or 3 minute drive to the town center. Tips: Ask for a window table for breakfast to enjoy scenic views with your morning coffee. The Albannach Hotel is small B&B in a former Victorian home which offers 5 rooms (3 of which are suites) and a Michelin-starred restaurant. 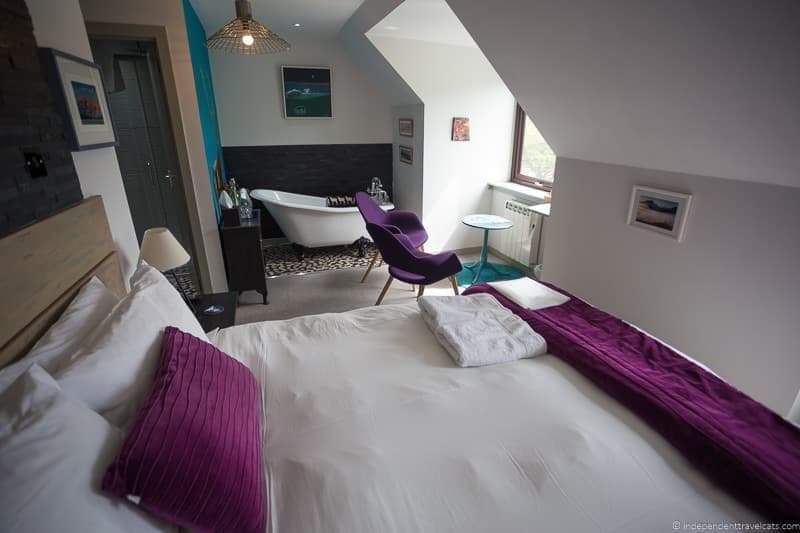 Rooms range from very traditional decor to the more modern with the Byre Suite being the most modern with a private terrace and hot tub. Views from the hotel look upon the hotel’s small walled garden and the loch. The hotel has a conservatory where you can relax or have pre-dinner drinks and canapés, and a restaurant, which is the most northernly Michelin-starred restaurant in Britain. We stayed in one of the double rooms with traditional decor which was very comfortable and we had a nice stay – I got a lot of work done here and I have to give a special mention for the strong WiFi connection in the room! Many people come here for the dining experience so we of course had to try dinner here (many room rates include both breakfast and dinner). We arrived late so we missed the canapés and pre-dinner drinks as it was our dinner time by the time we got dressed and ready. Dinner is a set menu so there are no choices (tell them any allergies/food preferences when booking) and we had a tasty meal served in the intimate hotel dining room. The next morning we had to leave very early (6am) before the breakfast service started, and one of the staff members was kind enough to arrange that cereals, fruits, yogurt, and all we needed to make coffee/tea were laid out and a table set for us. Overall, we had a great stay but it was way too short! NOTE: This hotel is currently not accepting bookings for 2019. It looks like it is being sold and will not open for the 2019 season. 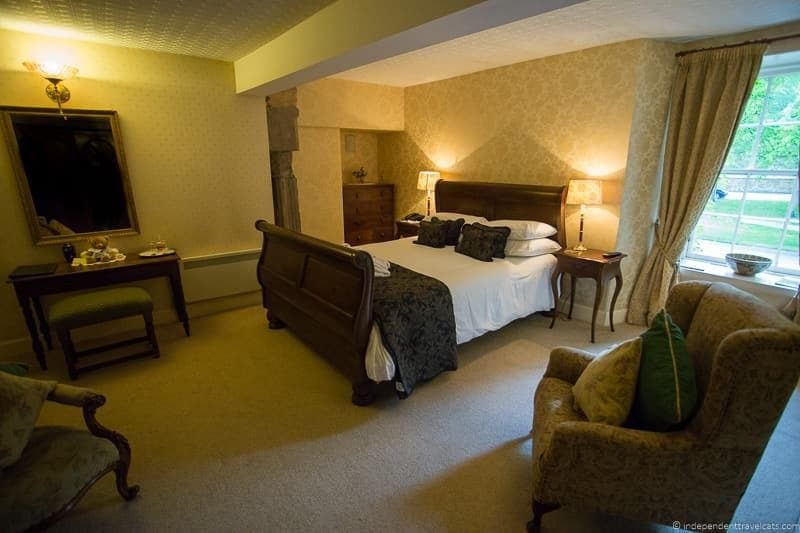 Price: Room rates typically range from £155 – £250 per night for double occupancy for bed and breakfast. Location: Located about 2 miles (6 minute drive) from the center of Lochinver. Tips: Note that the hotel does not permit guests under 13. The northwest corner of Scotland is a beautiful area so do slow down and take some time to explore. The Davar B&B is small 4-star B&B located in Lochinver offering four well-appointed rooms with modern amenities. 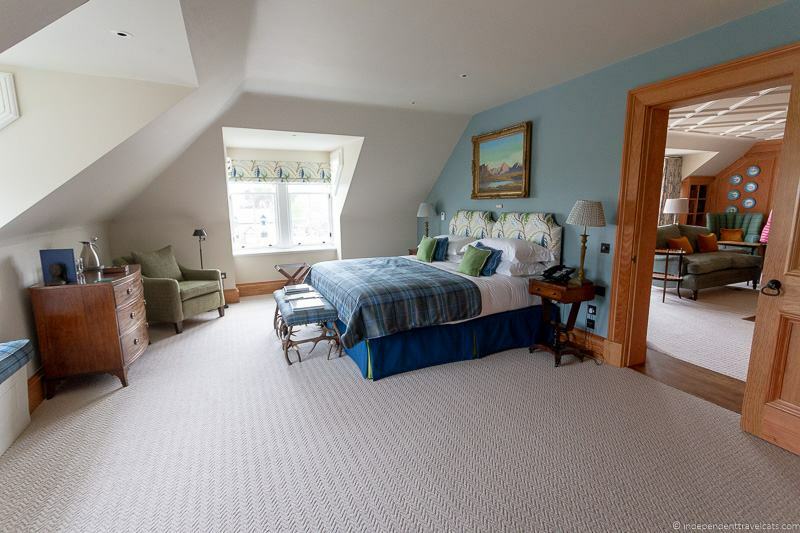 Each room is individually decorated and three of the rooms have views over the bay and one has a view onto the garden. The B&B also has a small lounge area with TV and games and a breakfast dining area. We had a lovely and comfortable stay here and the hosts were friendly and very willing to give suggestions for things to do and places to eat. The location is in Lochinver in a private residential strip of homes overlooking the loch. The breakfast here was delicious and includes a buffet of cold items plus a cooked to order option. Many of the items locally sourced and/or homemade – definitely one of the best breakfasts we have had along the NC500. We can highly recommend if looking for a nice B&B in Lochinver. 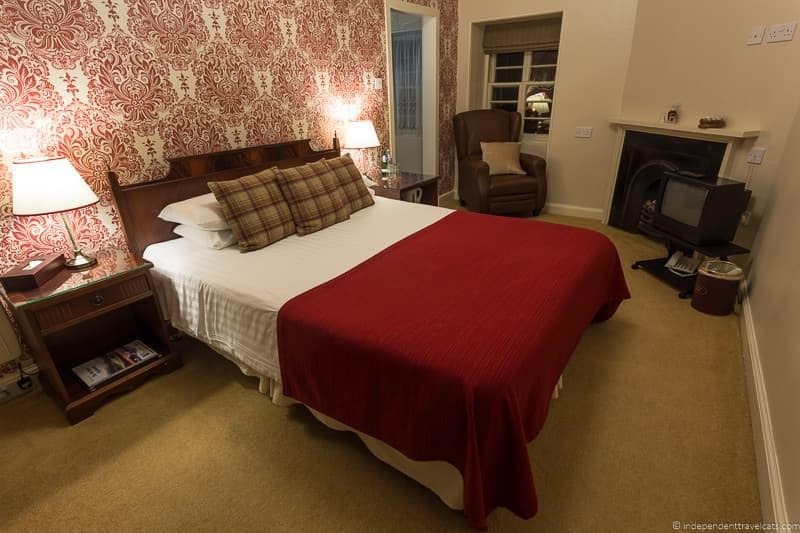 Price: Room rates typically range from £80 – £120 per night for double occupancy for bed and breakfast. Check Davar Guest House prices here to find the best rates for your dates. Location: Located in Lochinver, about 1 mile from the town center. Tips: The hosts are very knowledgeable about the local area and can give you lots of recommendations for hikes, scenic drives, local museums, restaurants, etc. 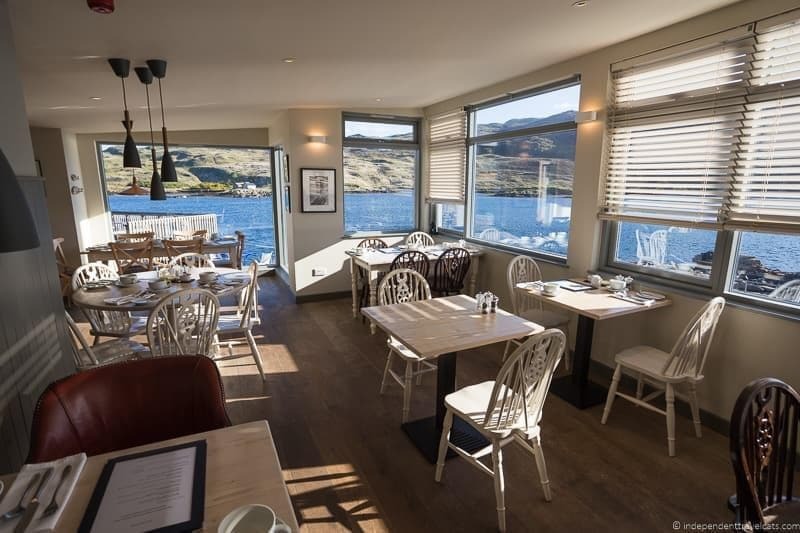 If it is a nice day and you are looking for some lunch, we recommend the 10 minute walk along the loch to Lochinver Larder (a local pie and lunch spot). You are also a 10 minute walk or 1 minute drive (in the opposite direction) from Highland Stoneware which sells some great locally made pottery and stoneware. Note that the owners do have pets on the property, although they do not allow them come into the guest rooms. Ullapool is a village sitting alongside Loch Broom, and is worth taking the time to explore. Along the North Coast 500, Ullapool has the second largest number of lodging options, and you can find hostels to 50+ room hotels here with the majority of places being family run bed-and-breakfasts and inns. We’ve stayed both in Ullapool and outside of it, and with a car, both are good options. Ferries run from Ullapool to the Isle of Lewis if you are planning a visit to the Western Isles or Outer Hebrides. The Royal Hotel is a 3-star 19th century hotel and is one of the largest and oldest in central Ullapool, offering more amenities than many of the others. This is a place to consider if you are looking for a more traditional larger hotel. It offers 54 rooms across a number of categories, which include family rooms and rooms with a loch view. The hotel also has a full-service restaurant and a bar. 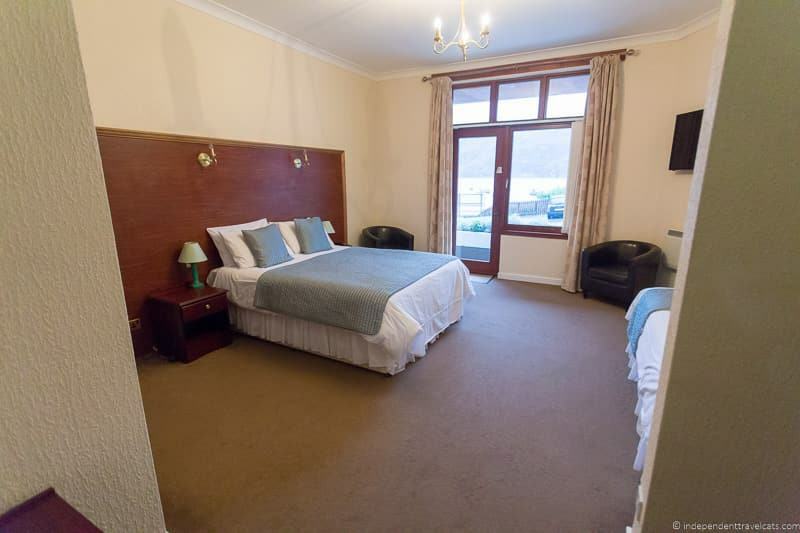 We haven’t stayed here but a family with small children told us they stay here because very few other hotels in central Ullapool offer the larger family rooms. Popular with bus tours and car club motoring tours since it is one of the largest hotels (along with the Caledonian) in the town. Price: Room rates typically range from £105 – £150 per night for double occupancy. Compare Royal Hotel prices to find the best rates. Tips: The hotel has a great lochside location. The nicest category of rooms are more spacious and come with balcony loch views. Westlea House is a family-run B&B that offers five comfortable and stylish themed rooms in the family-run B&B. Rooms include powerful showers and 2 rooms come with freestanding bath tubs. The eclectically stylish common areas include a dining area and guest lounge that contains a large collection of books, guides, and LPs. An interesting feature of the B&B is little listening nooks with turntables where you can listen to your favorites from the large vinyl selection. There is also a shed where guests can store bikes or other outdoor gear. We have not stayed here but met one of the friendly owners and had a look around the guesthouse and we could see why guests rave about this little B&B. 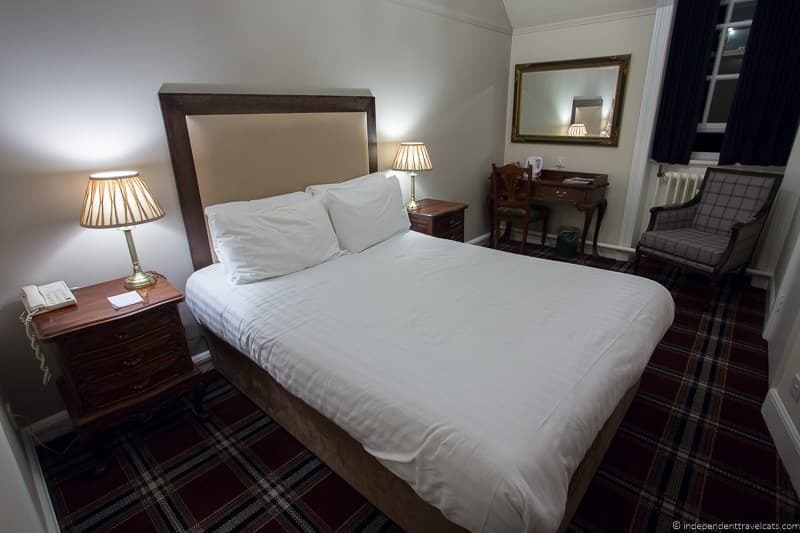 Price: Room rates typically range from £45 – £95 per night for double occupancy. Tips: The well-rated B&B is very popular and offers good value, so book well in advance to guarantee a stay here. 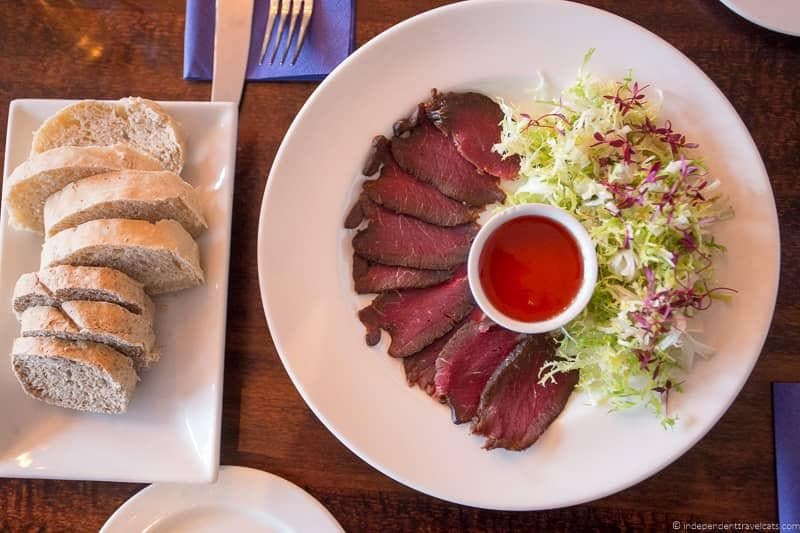 For nearby dinner options, we can personally recommend Ceilidh Place (reservations usually needed), The Arch Inn (reservations recommended), and The Seafood Shack (tasty takeaway). The Arch Inn on West Shore Street in Ullapool – The Arch Inn occupies a former 19th century fishing inn and store and is today a popular restaurant, bar, and small inn in central Ullapool. 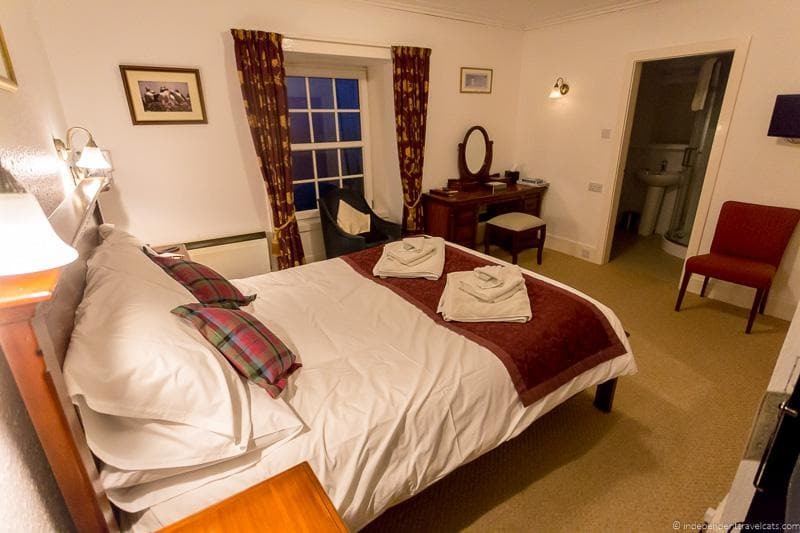 The Inn offers 10 basic but comfortable rooms, some with loch views. We haven’t stayed here but can personally recommend the bar and restaurant which often has live entertainment in the bar. Typical double rates: £80 – £110, check prices online here. Riverside Guest House on Quay Street in Ullapool– The Riverside Guest House is a small, quiet and comfortable budget B&B offering good value. We stayed here on a prior tour of the Highlands & Isle of Skye and it is a simple but comfortable place with a hearty Scottish breakfast! Typical double rates: £60 – £84, check Riverside Guest House prices online. The Braemore Square Country House is a boutique B&B located in a former nineteenth century staging post that served the Braemore Square Country House. It also offers 4 self-catering apartments on site. 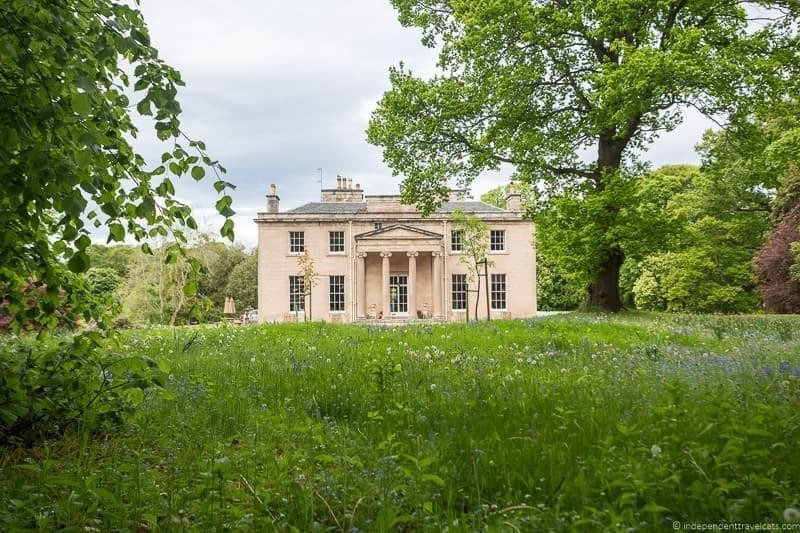 The Braemore Estate was later owned by Sir John Fowler, a famous Victoria era British architect whose work includes the Forth Rail Bridge and the early London Underground system. Braemore Square Country House offers spacious and comfortable rooms that are appointed with high-quality furniture, linens, and toiletries. Decor is clean and contemporary but still well-suited for a country house, and we could tell that the innkeepers pay a lot of attention to details. One of the king rooms comes with its own private lounge, and there is also a shared guest lounge. The lounges are great places to relax with comfortable sofas, reading chairs, log-burning stoves, and plenty of reading material (books, magazines, tourism information). The country B&B is run by South African couple Lisa & Chester and the couple live on site with their children. We found the couple to be friendly, knowledgeable, and eager to offer helpful advice. They also offer a handful of self-catering apartments in other buildings on the property. A fresh breakfast is served for guests staying in the B&B rooms in the guest dining area and the breakfasts are cooked to order using local produce, eggs, and meats, including eggs from their own chickens. We loved our large King room with the private lounge, had a tasty hearty breakfast, and enjoyed our time walking around the farm with Chester and seeing the animals, especially his prized herd of Highland cattle. It was a great photo opportunity to see so many Highland cattle close up (although don’t get too close as some are a bit aggressive!). Highly recommend for anyone looking for a country retreat B&B stay or rural self-catering stay as this place exceeded all our expectations! Price: Room rates typically range from £100 – £120 per night for double occupancy. Check Braemore Square Country House prices online to find the best rates. Note that the self-catering apartments normally require a 2 or 3 night stay. Location: Located about 10 miles (15 minute drive) from central Ullapool. Tips: The beautiful Corrieshalloch Gorge National Nature Reserve is just a mile or so away and there you can see a suspension bridge built by the former Braemore estate owner Sir John Fowler. Be sure to ask Chester and Lisa for recommendations of things to do in the area, as there are lots of hiking, fishing, kayaking, and other outdoor activity opportunities nearby. 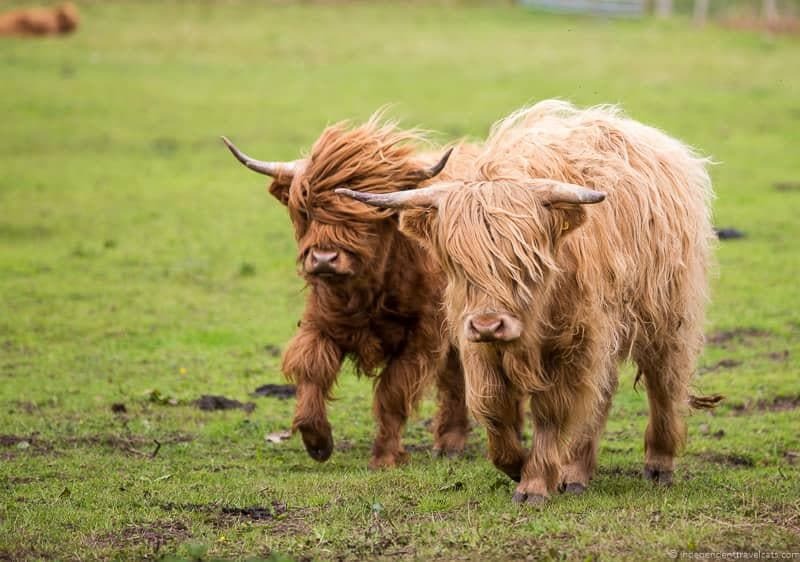 Chester and Lisa are also happy to take you on an informal tour of the farm to see the garden, chickens, and Highland coos. The Aultbea Hotel is a small 9-room hotel located alongside Loch Ewe in a former hunting lodge built in the 19th century. Although it has long been a hotel, it has been recently renovated into a comfortable, modern, and well-decorated place to stay. The hotel offers trendy decor and modern conveniences while still paying homage to its seaside history. The hotel has a public lounge as well as a restaurant and bar. 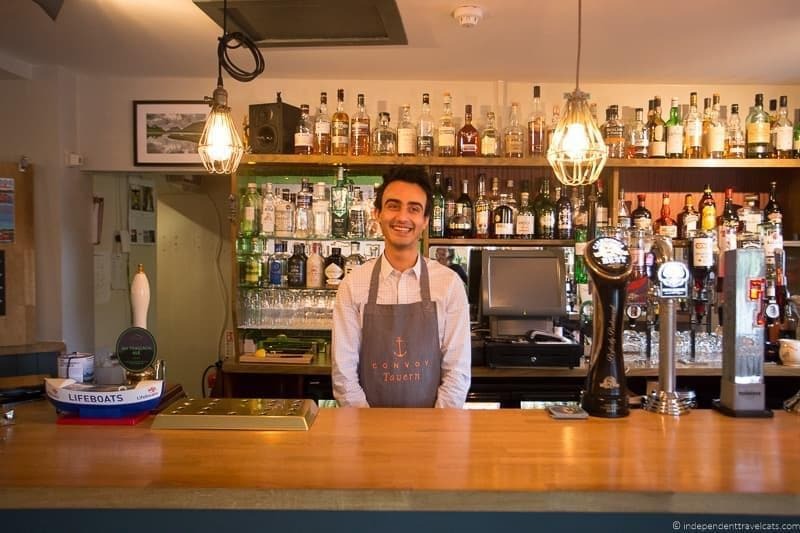 The hotel’s restaurant The Fat Whippet focuses on local seafood dishes and won the 2017 Hotel Restaurant of the year in the Scottish Food Awards. We stopped to eat lunch here and the food was delicious. Even if you don’t stay here, we highly recommend coming by for a meal in the restaurant or for a coffee or evening drink in the comfortable and lively Convoy Tavern. Note: Since our stay, the young London owners have sold the property (in early 2018) and we have not been here since that change. We have heard continued good things about the rooms and service, but that the quality of the food may have suffered. Price: Room rates typically range from £90 – £150 per night for double occupancy. Check Aultbea Hotel prices online to find the best rates. Location: Located along the coast of Loch Ewe in the small town of Aultbea, about 12 miles north (25 minutes drive) from Gariloch. Tips: Lots of lovely walks around the area and loch, and if you are looking for some tasty picnic items, stop at the nearby Isle of Ewe Smokehouse. If you are interested in maritime or war history, make a stop at the Russian Arctic Convoy Museum (exhibitions open seasonally) and learn how this area was involved in the World War 2 arctic convoys. Pool House is a 5-star luxury family-run guest house located in a 300-year-old house offering four unique and ornately decorated suites. The B&B was originally a fishing and hunting lodge for members of the Clan MacKenzie and later was used by the British military. Out of all the North Coast 500 accommodation options we have visited or stayed at, none stood out for the room decor as much as Pool House. We were blown away by the family’s collection of furnitures, antiques, and art that decorate both the public rooms and the suites. In addition to the four suites, there is a fifth room for single travelers with a separate entrance as well as two detached more private lodging options on the grounds. Suites are decorated with themes and our favorite was probably the Asian themed room which features an early nineteenth century Chinese marriage bed, although all the suites are lovely. We were led around the house by one of the owners who told us the history of some of the pieces, many of which were collected by her parents on their travels. All suite and rooms include nice sea views and some also include working fireplaces, private balconies, and/or claw-foot bath tubs. 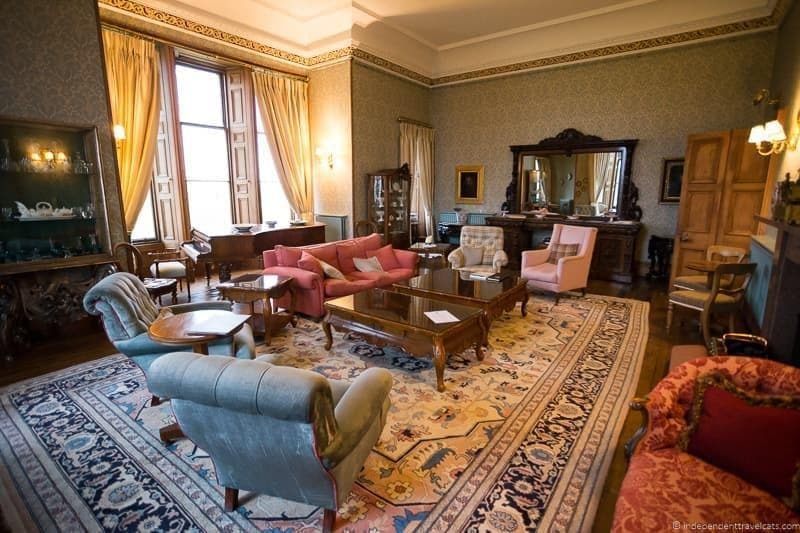 The public rooms include a comfortable drawing room, bar and billiards room, and dining room, and there is also a garden outside with a view of the loch. 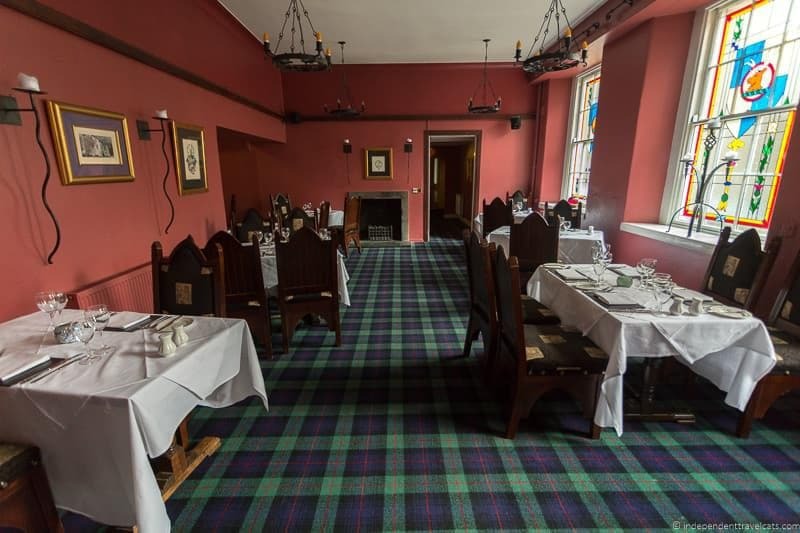 Full Scottish breakfasts are included in the rates, and dinners can also be booked in the hotel dining room with advanced notice. 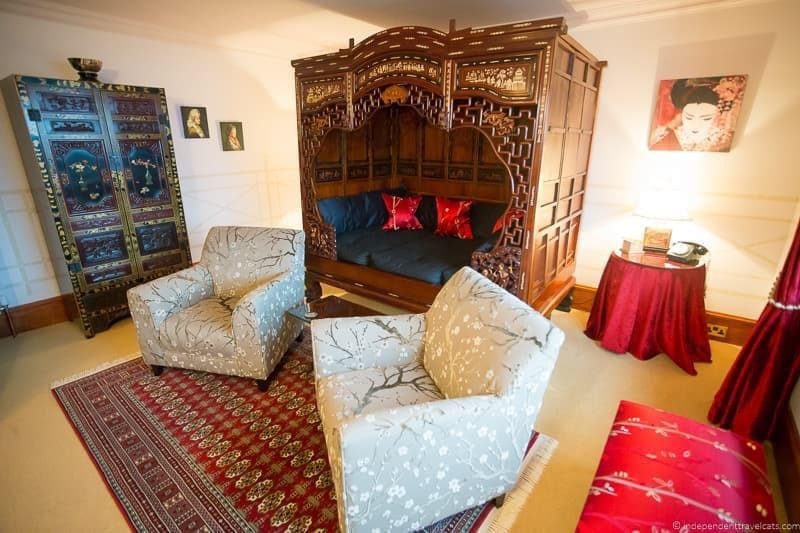 If you are looking for an intimate luxury guest house with a Victorian feel, I would book a night or two here. Recommended for couples seeking a romantic weekend away. 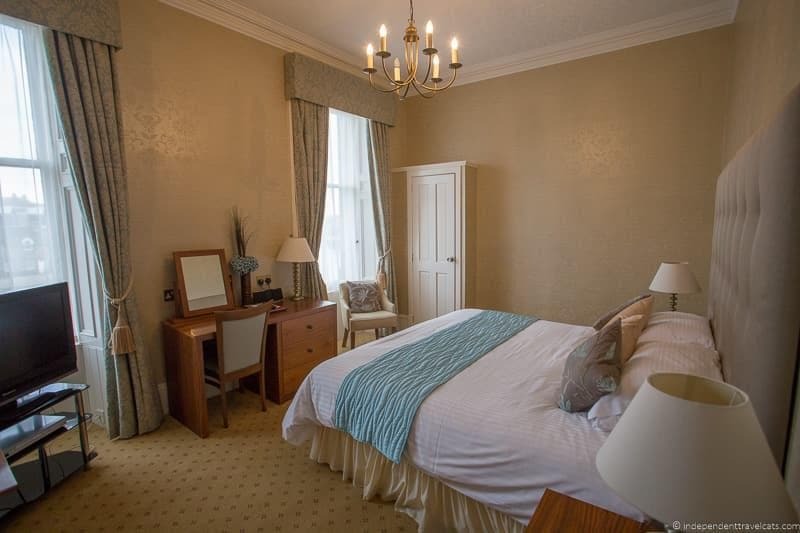 Price: Room rates typically range from £225 – £375 per night for double occupancy. Compare Pool House prices online to find the best rates. Location: Located along the coast of Loch Ewe in the center of the small town of Poolewe, about 6 miles northeast (11 minutes drive) from Gariloch. Tips: Note that the B&B does not accept guests under 15 years of age. Be sure to ask the owners about the history of the hotel and its past owners, as well as their links to famous people in Scottish history. If you enjoy gardens, be sure to plan a stop at the nearby Inverewe Gardens (4 minute walk) which is a pretty botanic garden run by the National Trust of Scotland. Golfers may want to check out the Gairloch Golf Club, although the 9-hole course is not the best course along the route, it offers some of the best views on a sunny day. 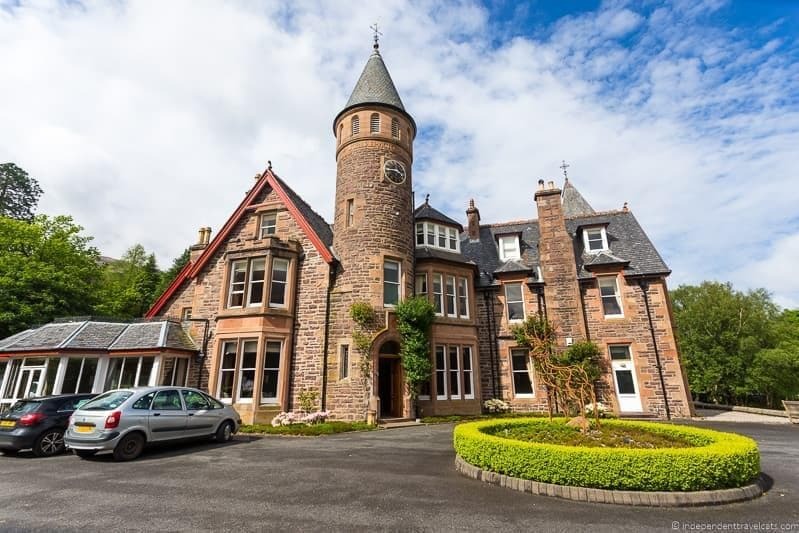 The Torridon is a 5-star 18-room country house hotel with castle-like turrets. 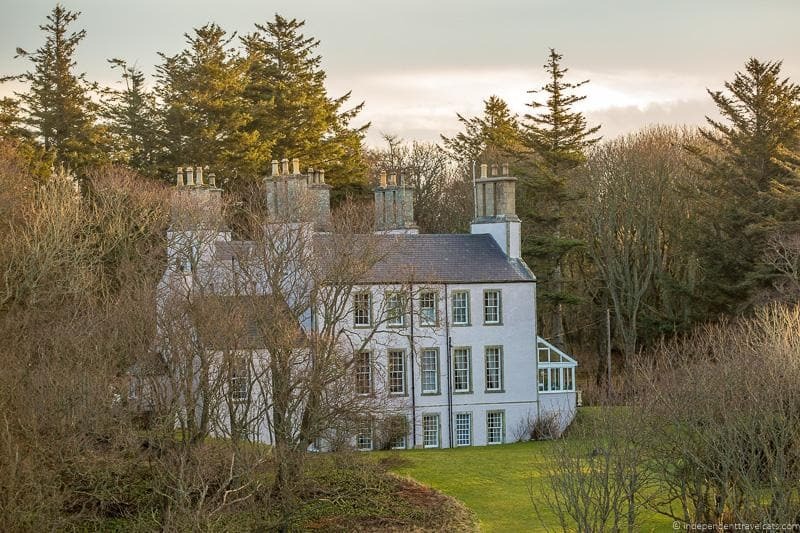 It is the former hunting lodge of the Earl of Lovelace (husband of mathematician Ada Lovelace), and is probably the most well-known hotel along the North Coast 500. The hotel has a mix of traditional and contemporary decor and offers a number of luxury amenities and services. Rooms include fine cotton linens, flat screen TVs, bathrobes, tea and coffee making facilities, and luxury toiletries. Some rooms also have views of the loch and/or mountains and some have Victorian style bathrooms. 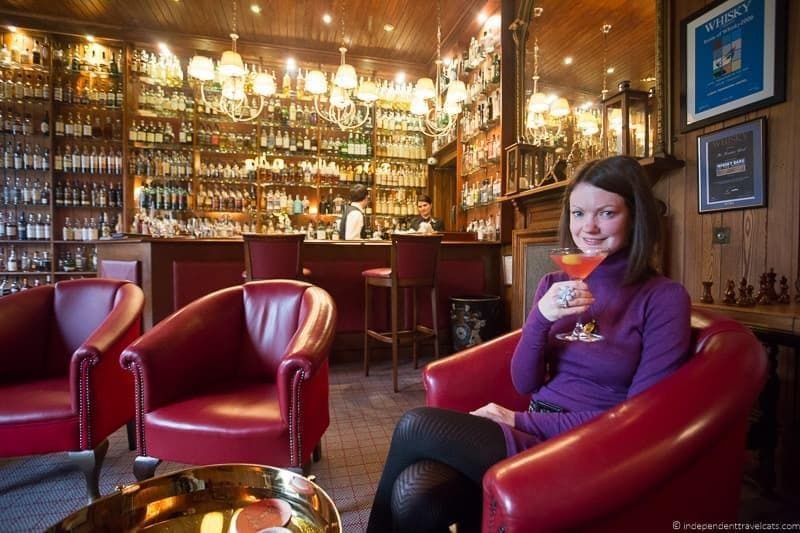 Its public rooms include a large drawing room, bar known for its large selection of whisky, and a restaurant (open to non-guests with reservations). 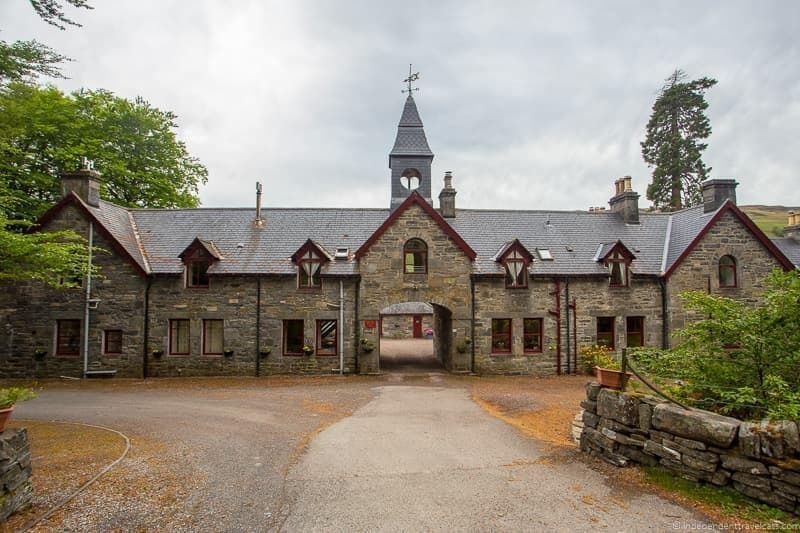 It has a lovely location on a 58-acre estate next to Loch Torridon, with a large kitchen garden and a field where you can see Highland cattle and Tamworth pigs. The Torridon also offers a number of day activities on the estate or nearby that include clay pigeon shooting, guided hikes, archery, gorge scrambling, and kayaking. We had a lovely stay here, including a nice afternoon tea in the drawing room, drinks at the bar, and an excellent dinner in the restaurant. 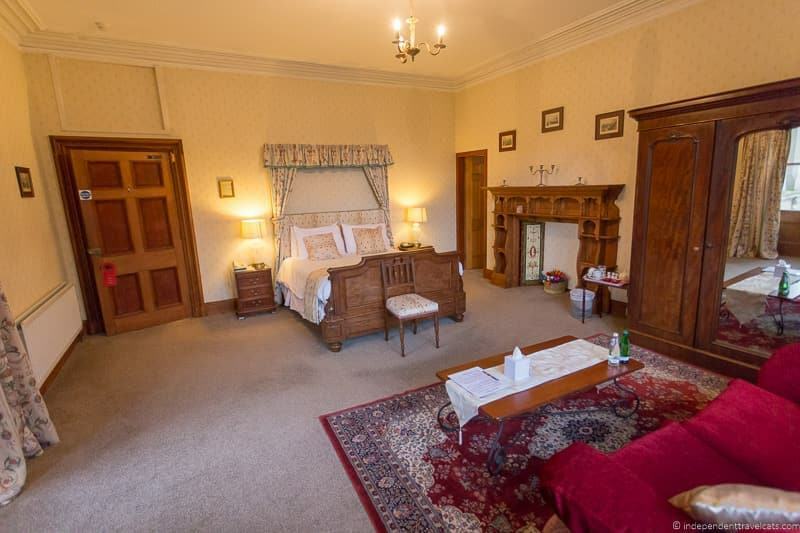 The Torridon lives up to many people’s imagination of a Victorian country estate and is definitely a popular lodging option along the North Coast 500 with many people taking advantage of the offered day activities and tours. 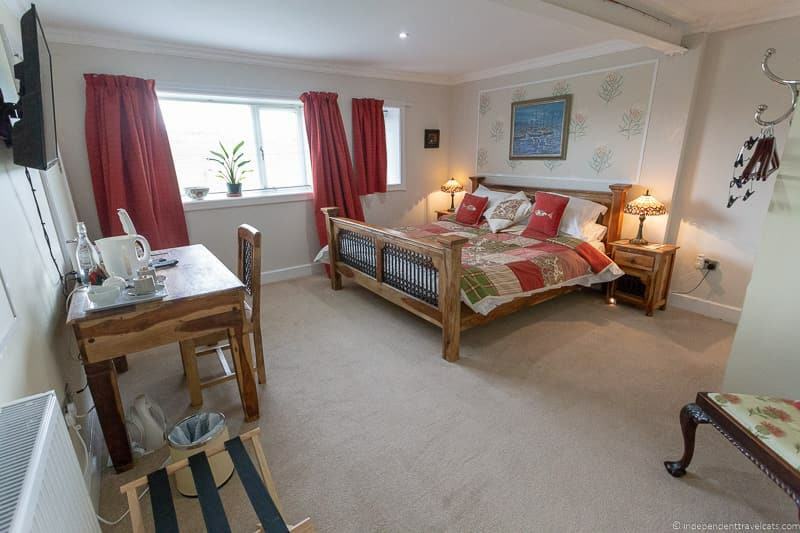 Price: Room rates typically range from £250 – £475 per night for double occupancy. Check The Torridon prices online to find the best rates for your trip. Location: Located 2 miles from the little village of Torridon next to Loch Torridon, about 12 miles southwest (25 minute drive) from Kinlochewe. Tips: Book well in advance to guarantee a room here and if you want a really spacious room, book a suite. 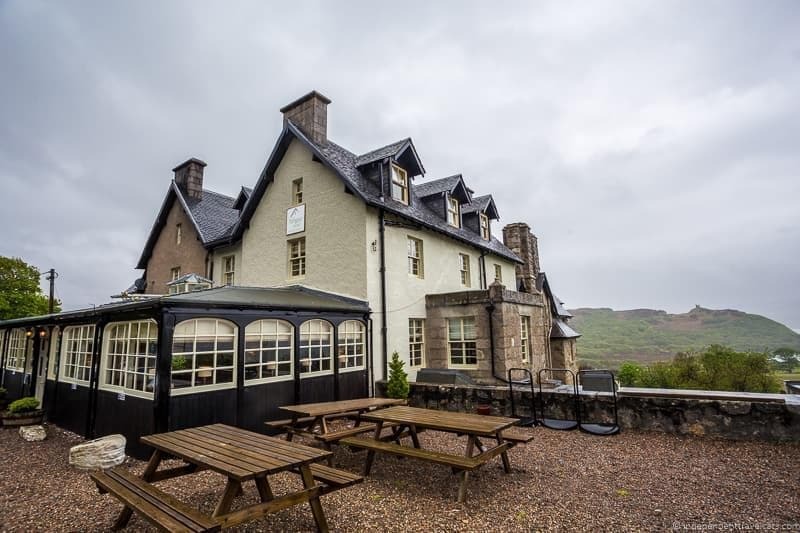 For a more relaxed (and inexpensive) stay or meal, check out the next door Torridon Inn, which is owned and run by the same company and well-suited for families. The Torridon also has a private self-catering option called the Boat House. If you are not staying here, you can still book a meal, have a drink, or afternoon tea here. 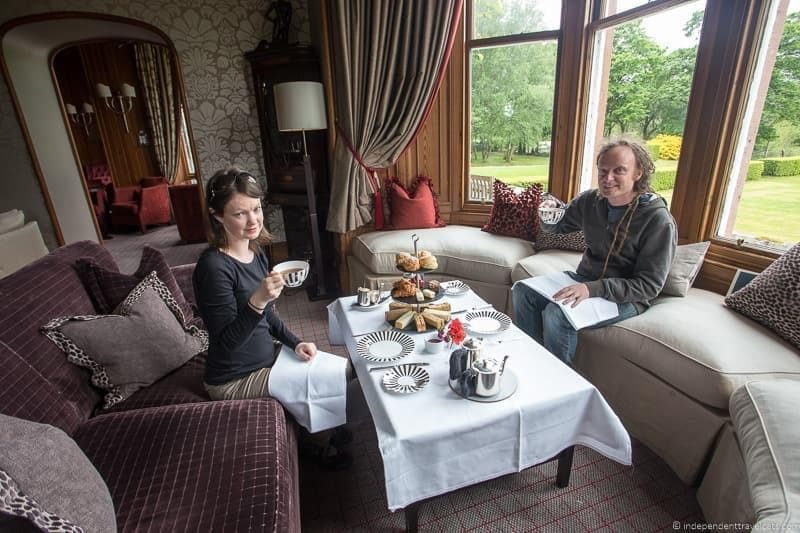 It offers one of the best afternoon tea options along the NC500. This was our final leg of the trip before returning back to Inverness (or it might be your first leg if heading west), and while we found scenic spots and things to do along this stretch, we found fewer North Coast 500 hotels. 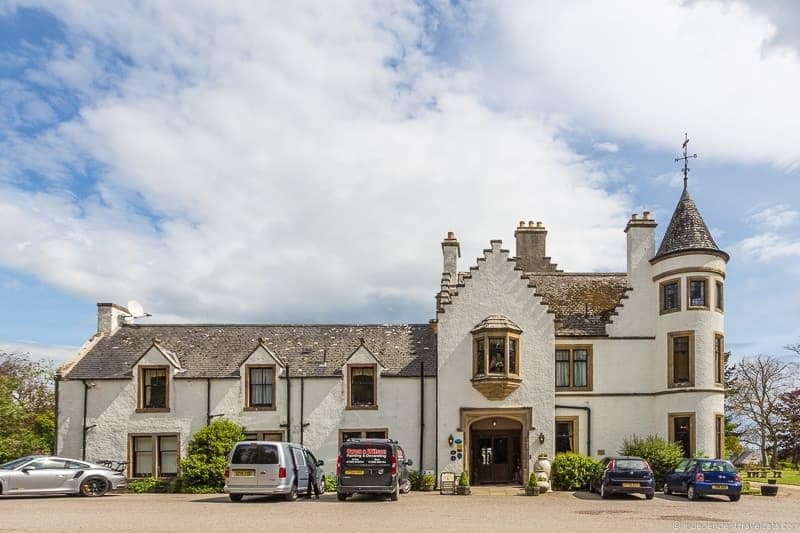 We can highly recommend Coul House Hotel (below) which can make a nice final stop, or you can also check out the Dingwall to Invergordon hotels listed earlier as those are within a 30 minute drive of here as well. For those returning to overnight in Inverness, you can see our Inverness hotel recommendations earlier in the article. Coul House Hotel is a 22-room family-run country house hotel surrounded by gardens, a large lawn, and trees. The building was built in 1821 for Sir George Steuart Mackenzie by the same architects who designed the famous spire atop the Tron Kirk on Edinburgh’s Royal Mile. The rooms offer traditional decor, modern conveniences, and most come with either a garden or mountain view. Public rooms include ornate ceilings, decorations, and fireplaces. The hotel also has a full-service restaurant, and although we only had breakfast here, the dinner menu looked tempting. The outdoor spaces include beautiful gardens, shaded places to sit under the trees, fairy trails designed with families in mind, and a golf practice area on the lawn. 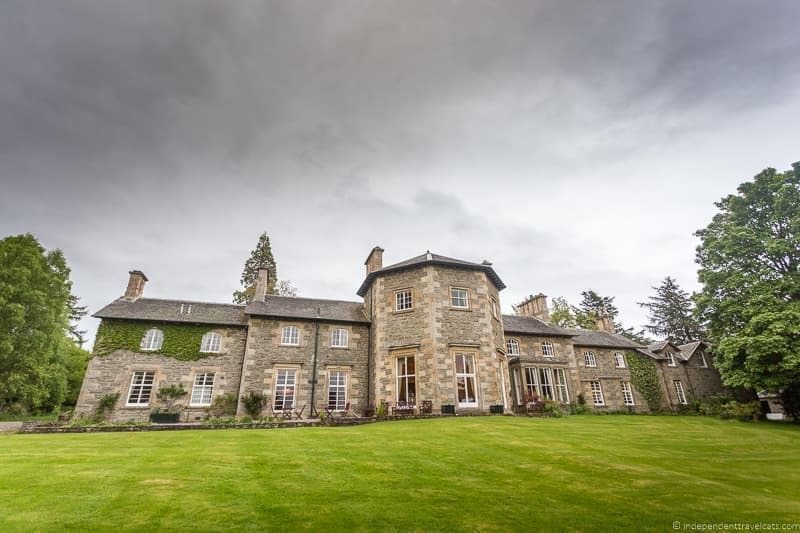 The Coul House Hotel is known as one of the most pet-friendly places to stay along the NC500, and you may even get a chance to meet the owners’ own dogs. We found this to be a relaxing and scenic historical hotel with friendly staff, and we would highly recommend it for those looking for a place to relax at the beginning or end of their North Coast 500 road trip. Price: Room rates typically range from £95 – £300 per night for double occupancy. Check Coul House Hotel prices online to find the best rates. Tips: As you get near the hotel, be sure to keep a lookout for the sign for the turnoff as it is located a couple of minutes drive off the road so you won’t see the hotel from the road. Be sure to spend some time in the gardens here and if you have kids, be sure to check out the Fairy Trail. Nearby are Ben Wyvis and the scenic Falls of Rogie. There you have it, our list of recommend North Coast 500 hotels along this new popular route around the top of Scotland. We hope you find these recommendations helpful in planning your own trip! Is a North Coast 500 road trip on your radar? Which of these North Coast hotels would be on your accommodation wish list? If you have stayed in any of these hotels, or any other places along the NC500, we’d love to hear your personal experience and tips. If you are planning a North Coast 500 road trip feel free to ask us any questions about any aspect of your trip below and as always we’ll do our best to answer your questions! Just wanted to say how wonderful your North Coast 500 hotel guide and your planning guide are. We could not have driven the NC500 as worry-free and organized as we did without your great guides. We used them before and throughout our road trip! So much great recommendations and advice, much superior to everything else out there as we could tell that you put a lot of time into them and obviously know this route very well! Thanks again! Great post on the NC500. We will be using a lot of the information provided in your articles. We have just completed a fantastic tour of the Outer Hébrides in a motor home which was our proposed method for the NC500 next year. However, after seeing the hôtels you guys recommended we may have to do it twice. Once in the motorhome, then ditch the kids and complete a 2nd circuit staying at the hôtels. Very thorough blogging. Thanks! Great job! Thanks so much for all these posts on the NC500. I’m trying to plan for June and I’m already finding many places fully booked. But these posts are very helpful. Hi Kristina, I am so happy you are finding our North Coast 500 articles helpful as you are planning your own road trip. We are actually headed back up there later this week to drive it in the winter. I am a bit surprised so many are already fully booked for June. We do recommend booking NC500 lodging 6 months in advance if you can but obviously this is often not possible for people. We drove it in mid-May last year and there was still plenty of places with availability but early to mid-May is a quieter time than June-August. If there are any special must-stays for you, I’d call and ask what availability they do have during your trip to see if there may be a way to tweak your itinerary. If there are any specific towns/areas you need additional NC500 lodging recs, just let us know. There are loads of great places throughout the route – we couldn’t include them all in our list! Also note that some of the smaller places that only do direct bookings may not have their full summer availability up as many of the smaller spots don’t reopen until March or April. Best of luck, and feel free to report back on your North Coast 500 experience! Hey guys, this post is so informative for the people who want to do a NC500 road trip. Sounds great for those who love to travel and be outdoors. wow! i love the pics of North Coast 500 hotels! all touch of classy, im going to show this to my hubby since he is planning for our 15yrs anniversary… i know he will like one of these hotels! First off, we didn’t even know there was a NC500, so thanks for putting that on our radar! It’s such an obviously great idea – so we’ve Pinned this one for later reference. Pairing the drive with a castle stay sound like a great plan…we just need to get a trip together. Fantastic pictures as usual – makes me recall how beautiful Scotland is, and how I’m overdue for another trip there! Love the castle hotels and the country manor-style of so many of the properties you’ve highlighted here. So atmospheric and full of history. One of the reasons I like getting away from the cities in the UK! Wow. What a great selection of hotels. 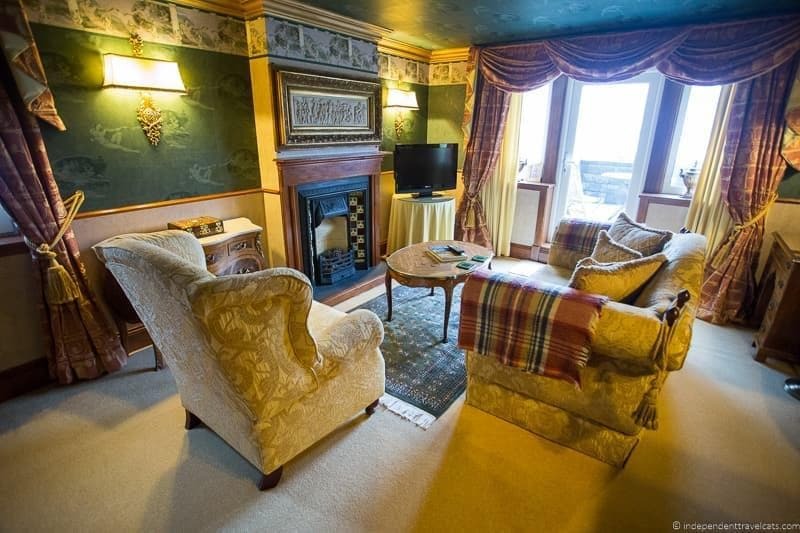 The Dornoch Castle Hotel photo really made me wish I had stayed there when I was touring several years ago. My daughter thanks you for the photo of the highland cattle; they are her favourite “large” animal and one still adorns her iPad as a screen saver. I had not heard of the North Coast 500 before, but now I am really intrigued. It looks like a great road trip. And wow, you found some great places to stay. I really appreciate all the details that you provide. Pinning this for future reference. You have chosen a great selection there, I am not sure which one I’d choose first. 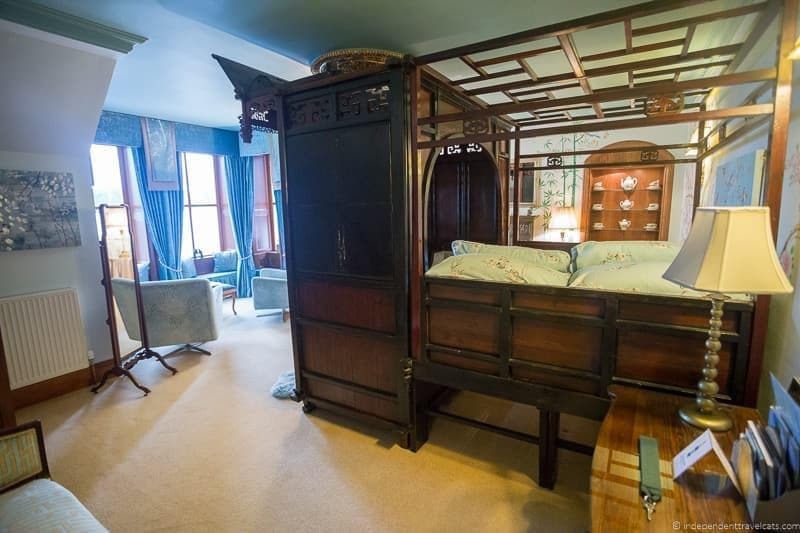 A stay in one of those castles would be a treat and I’d love to see the Chinese Marriage bed. Wow! These are all exquisite hotels! I wouldn’t even know which one to pick first!! The beds at the Pool Hotel look incredibly unique and amazing! Love that historic wood decor! If I were doing this route, I would definitely try to stay at as many of these as possible!! Thanks for linking up with TheWeeklyPostcard! Jessica, you and Laurence are always traveling in style. I’m glad to see all these “posh” places through your eye because most likely I’ll never get to stay in most of them. They look great, but I bet they are also expensive. I’m sure most visitors to Europe are not aware that these gorgeous castles are actually hotels with rooms for rent, so it’s great that you advertise them. So many fantastic properties! I would like to stay on a castle or tower hotel along the North Coast 500. A lot of the information you provided at the beginning of the post is essential. People who are not used to travel in Europe may not be aware of how hotels are different in certain countries. We experienced the part of staying in a hotel without an address in Iceland. I took a look at Google before the trip and noticed the hotel was not going to be even visible from the main road. So, I hoped for a big sign and sure it was there! But, we had to pay a lot of attention to spot the sign. In rural areas, there may not be anybody around to ask for directions.